Mikells on the Way: Part II?! Well … kind of! 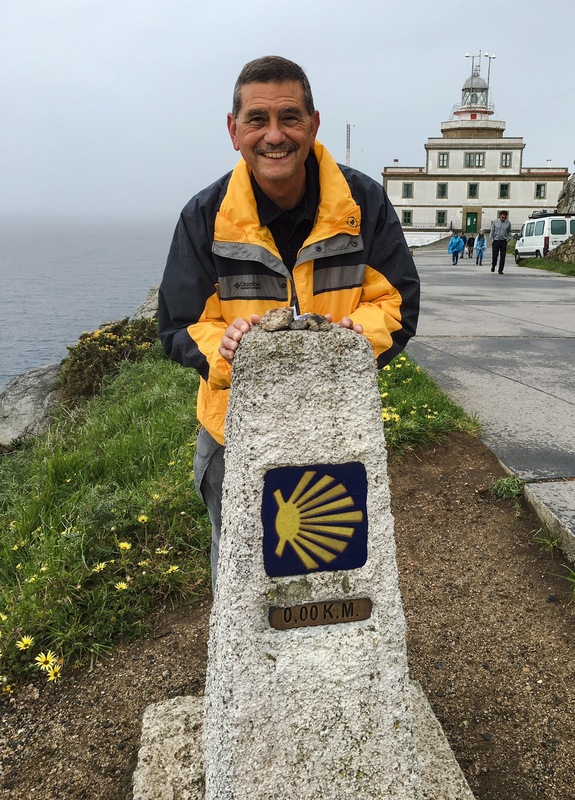 Mikey’s hitting the road to walk the Camino del Norte to Santiago de Compostela. While the destination is the same, this is a different path which hugs the northern Atlantic coast of Spain. Although Frank can’t make it this year, you can follow Mikey on his new webpage: www.mikeyontheway.com Hurry, though – he starts walking on Friday, June 9th. 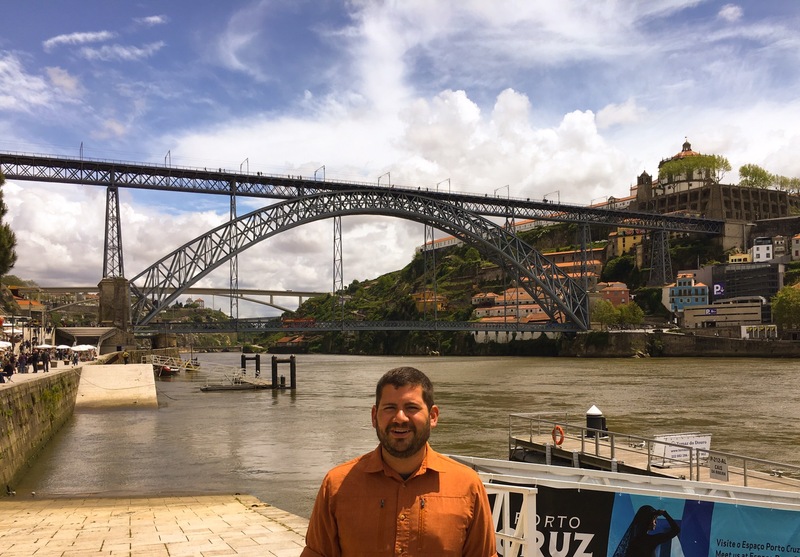 Buen camino and let the sequel begin! After an arduous overnight on the Portuguese “Diesel Express,” we arrived in the Spanish capital. Let’s just say this isn’t Frank and Mikey’s first time at the rodeo as we’ve both previously been to Madrid several times. Still, we took time to revisit various special places, see some new things, and rest before heading back to the States. 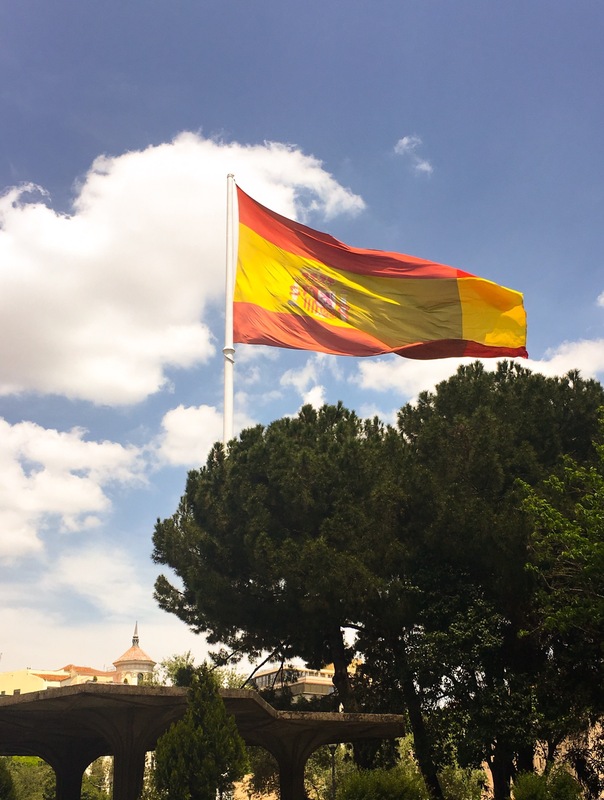 This was probably the biggest Spanish flag we’ve ever seen! 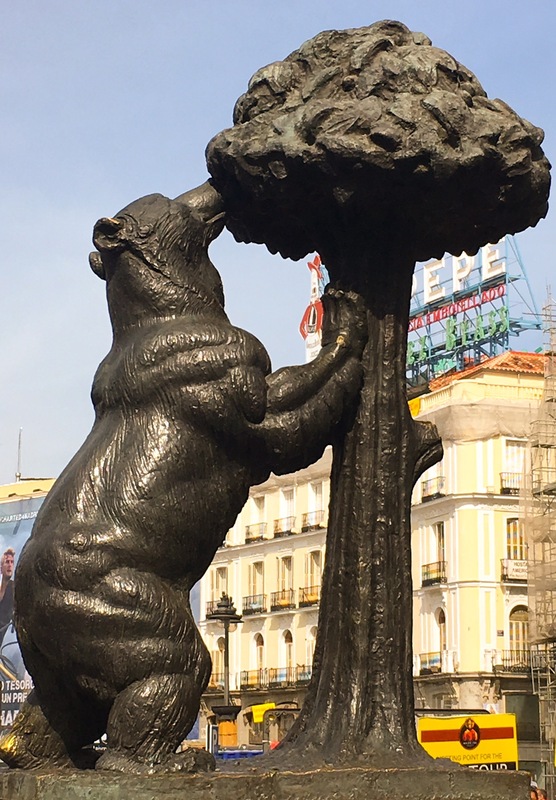 Speaking of huge, this 20 ton statue in the Puerta de Sol depicts a bear eating from a fruit tree and is the symbol for the city of Madrid. It has also been the sight of several protests against the local government during our stay. 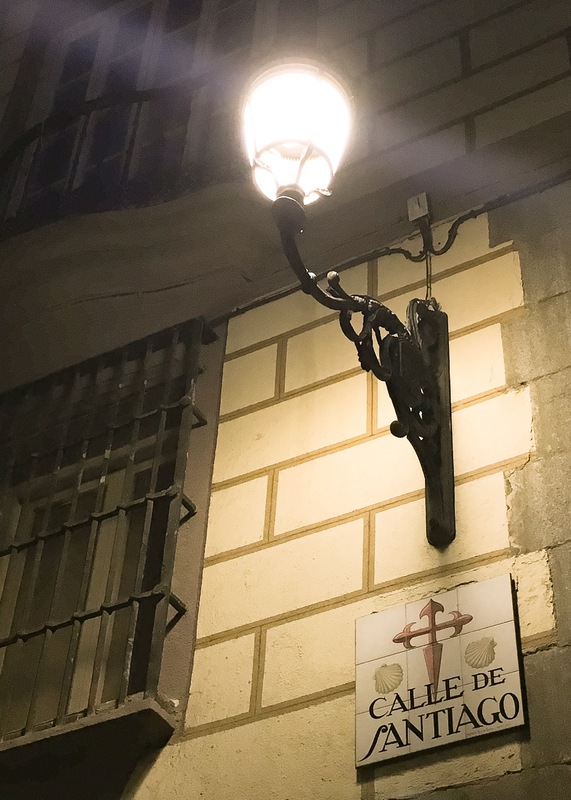 In 2000, Mikey spent a week in Madrid. 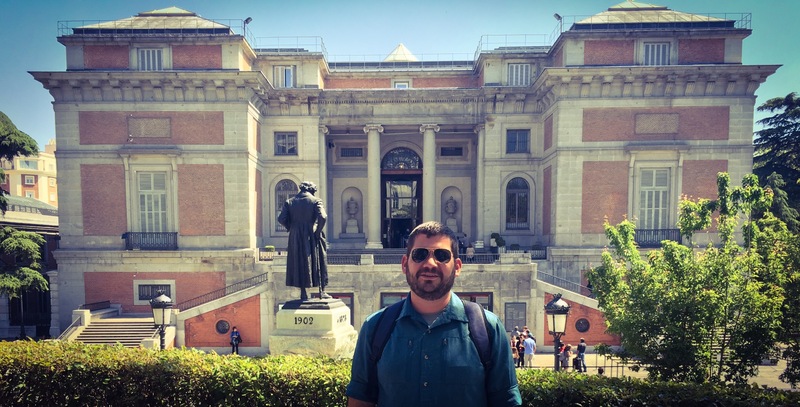 As a Spanish visa-carrying international student, he was allowed free entrance to the Prado art museum. 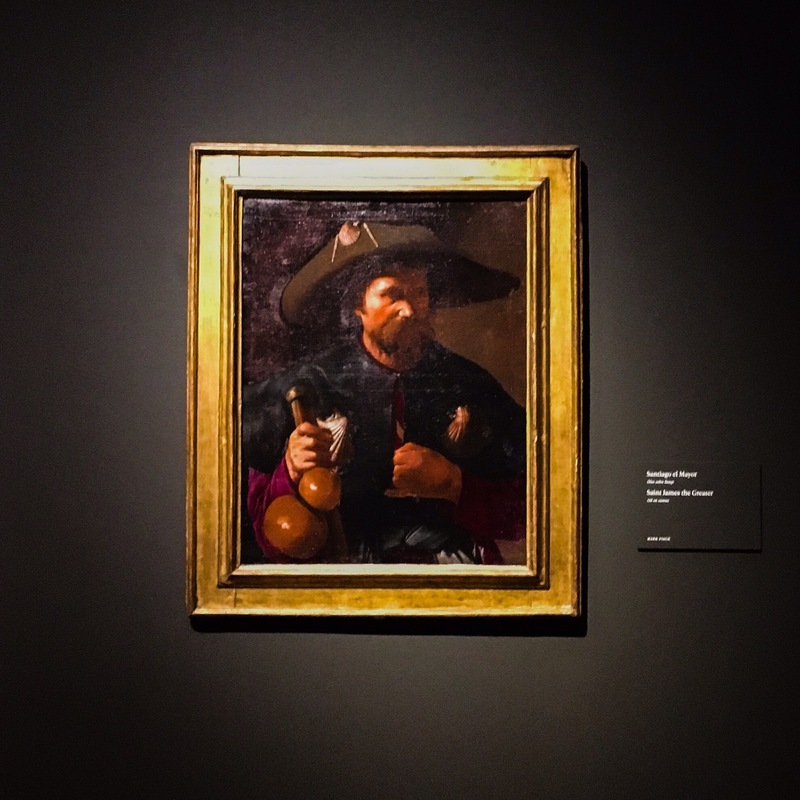 Needless to say, he went for a few hours each day to study the works of Goya, Velazquez, El Greco, and others. It was a true highlight of his sojourn in the capital. 16 years later, with no student visa and having to pay 14€, the Prado has lost some of its appeal. 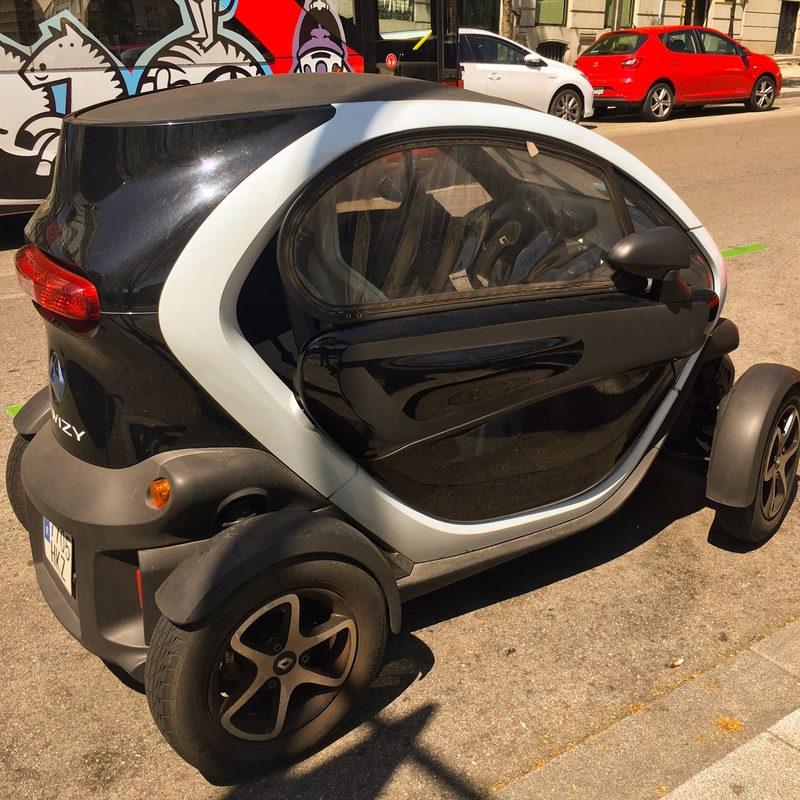 No, that’s a joke – actually, the Prado has undergone a remodel and is quite easy to navigate in much less time. But, here’s the rub: as of 2007, visitors are no longer allowed to take photographs or video inside the museum. Mikey found this out the hard way when a cretinous old security guard approached him and literally swished her #2 pencil in front of his face whilst informing him of this new rule. The one picture he snagged was (naturally) of our friend, Saint James! 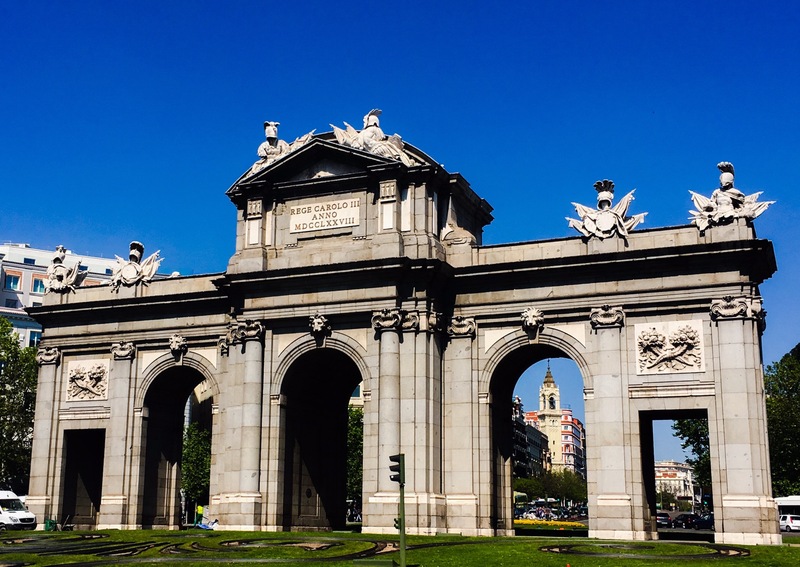 After a bit at the Prado, we walked around the capital. 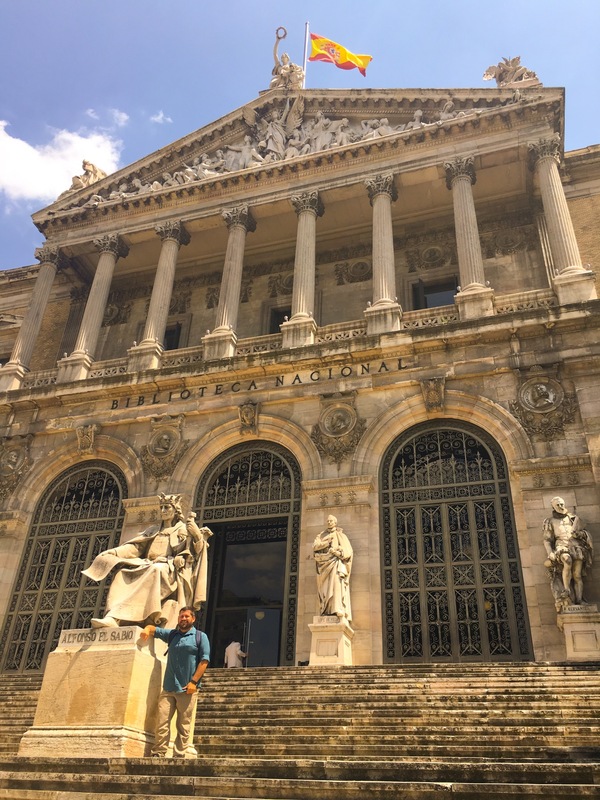 This is a view of the Madrid City Hall building. 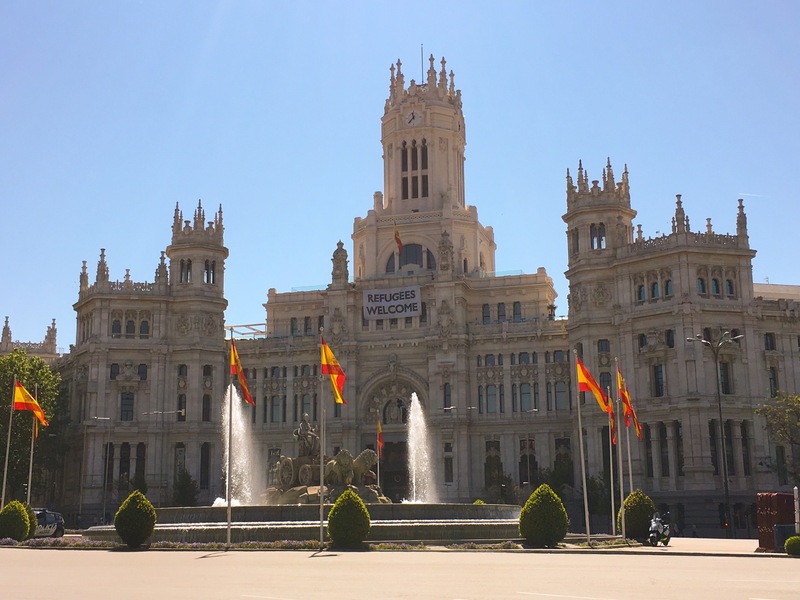 While its castle-like architecture is impressive, the predominant banner says much about the current atmosphere in Spain. 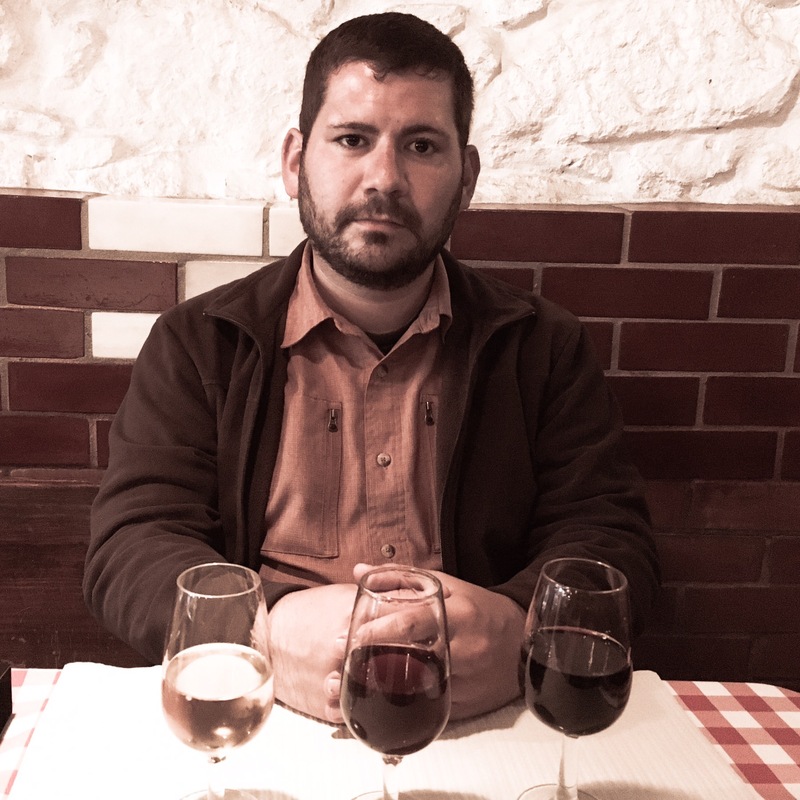 Unlike France and Germany, our Iberian hosts are willing to take a risk on providing hospitality to those unknown. 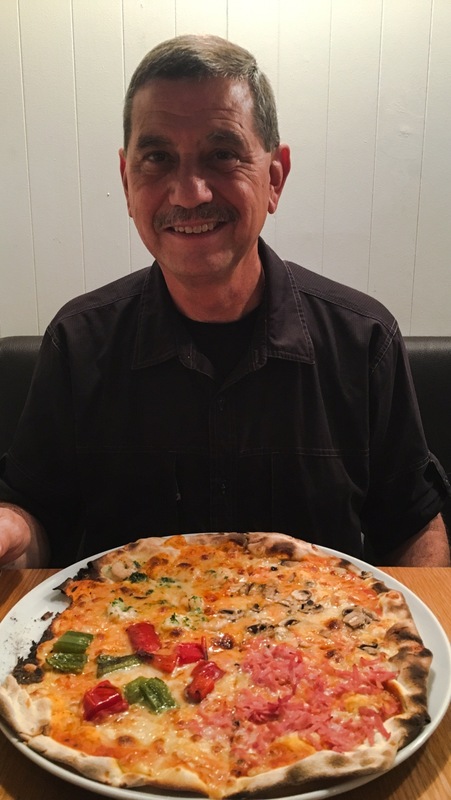 Mikey and Frank – both strangers in a foreign land – were made to feel welcome in this country for well over a month. Likewise, those from Syria, Iraq, and all other troubled places seeking a better and safer existence can find a place here. 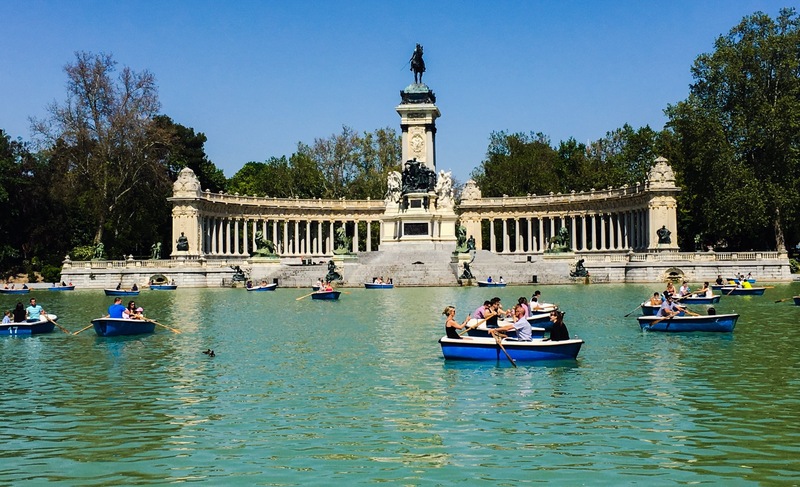 Following such controversial meandering, we retired to Retiro Park for a bit of relaxation. Frank has been the best of sports throughout this trip. As a friend put it today, it seems like Mikey inserts Frank into the most awkward situations and Frank just rolls with the photo! Well, Frank wouldn’t do the boat thing today. That’s ok, though – Mikey looked at the water and immediately backed down from the boating challenge!! Still, we found a sporty little number for someone quite close to Mikey and Frank! Speaking of good sports, here’s to hoping Mom likes purple! Ok, we played around a little, but the truth is that both Mikey and Frank are history buffs. As such, we ponied up 3€ each for the BEST Spanish history museum ever. 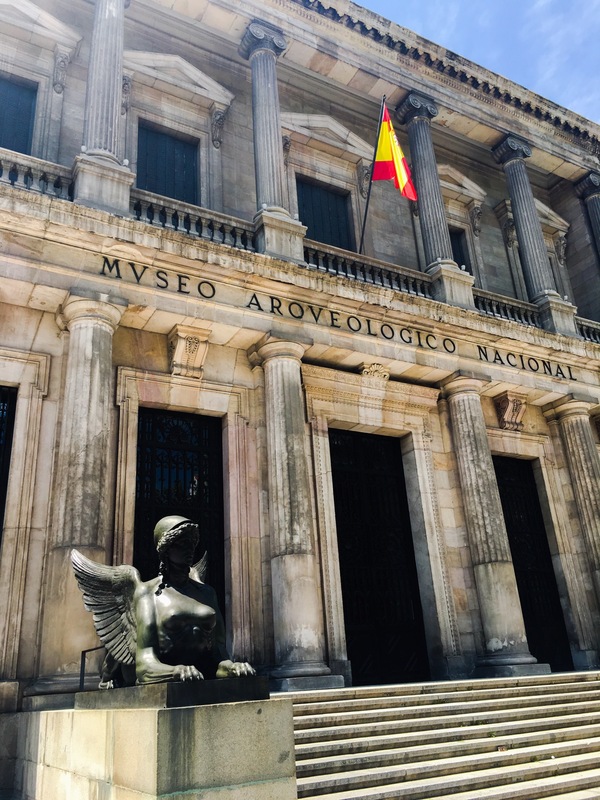 The National Archeological Museum in Madrid is a true jewel. 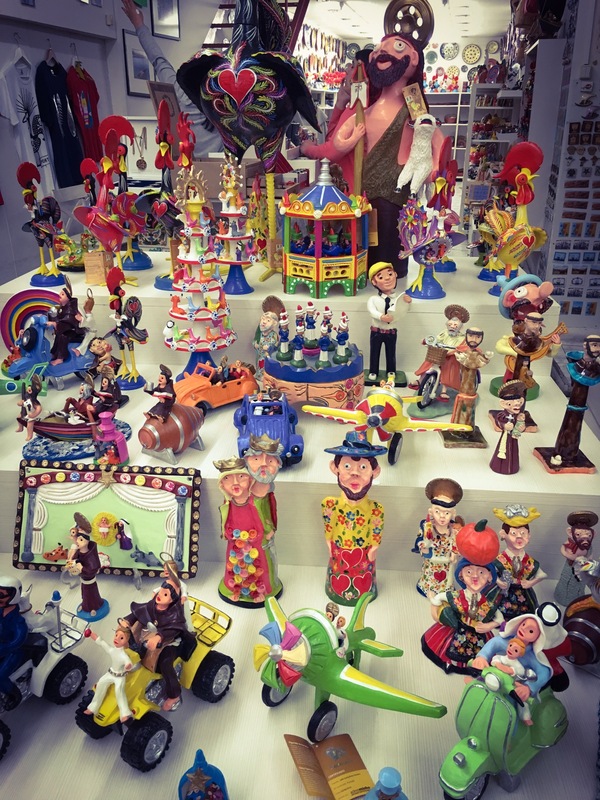 Having visited many history museums, both Frank and Mikey agree that this one is pretty close to Smithsonian quality – really!! 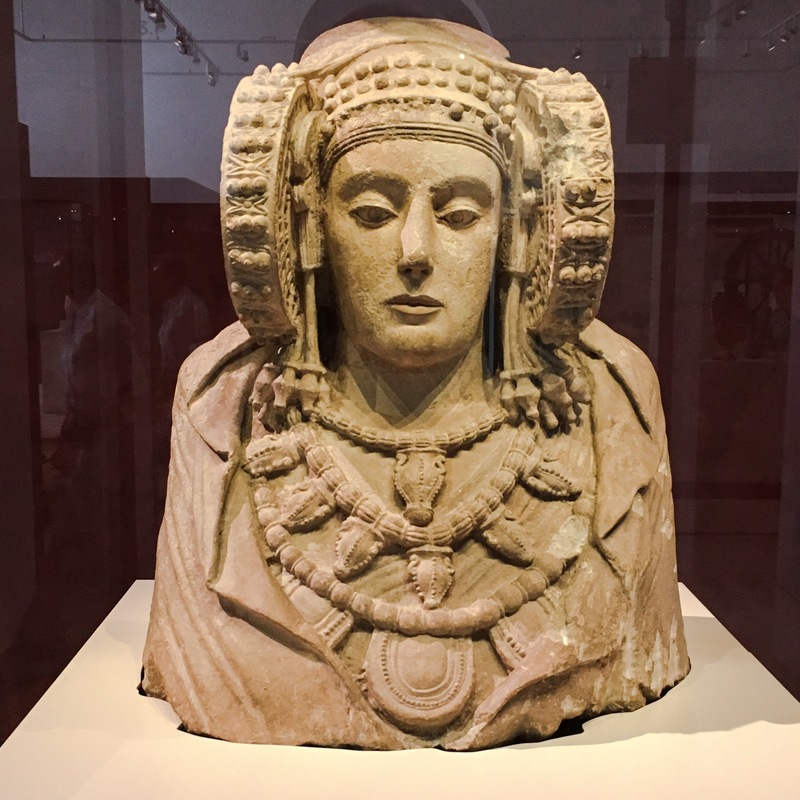 A centerpiece of the museum and long held symbol of Iberian culture, the Lady of Elche statue hails from the 5th or early 4th century BCE. 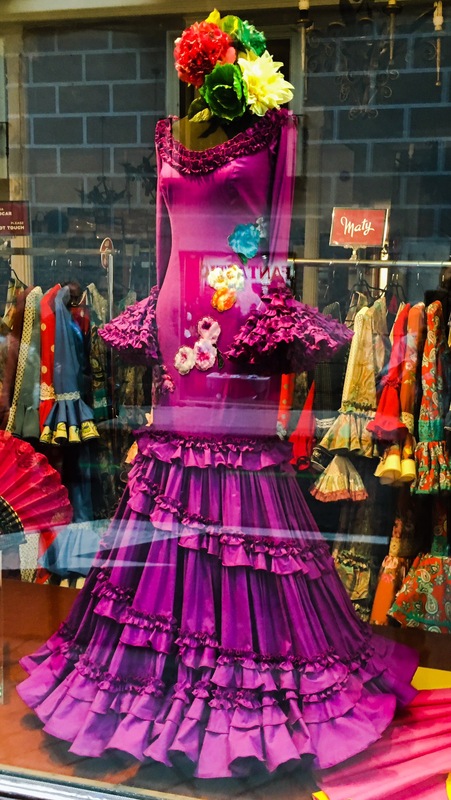 One often overlooked beauty of Spain is her Roman history. 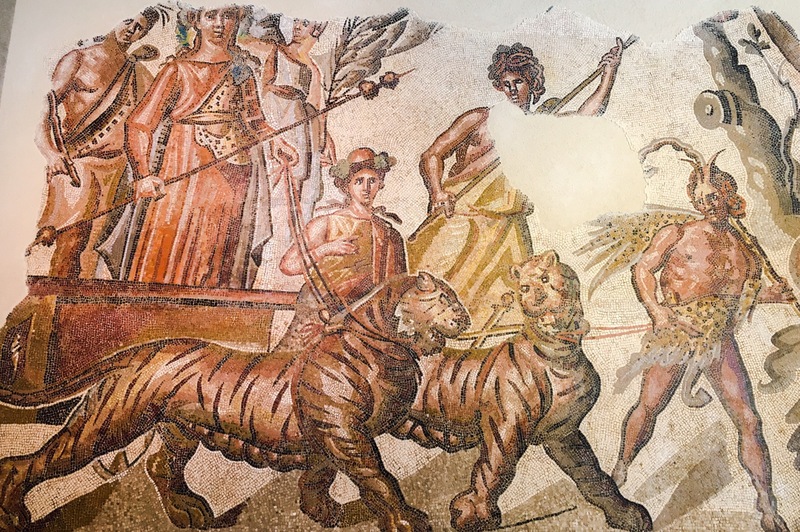 This tiled mosaic depicts the triumphant entry of a Roman circus into Hispania. 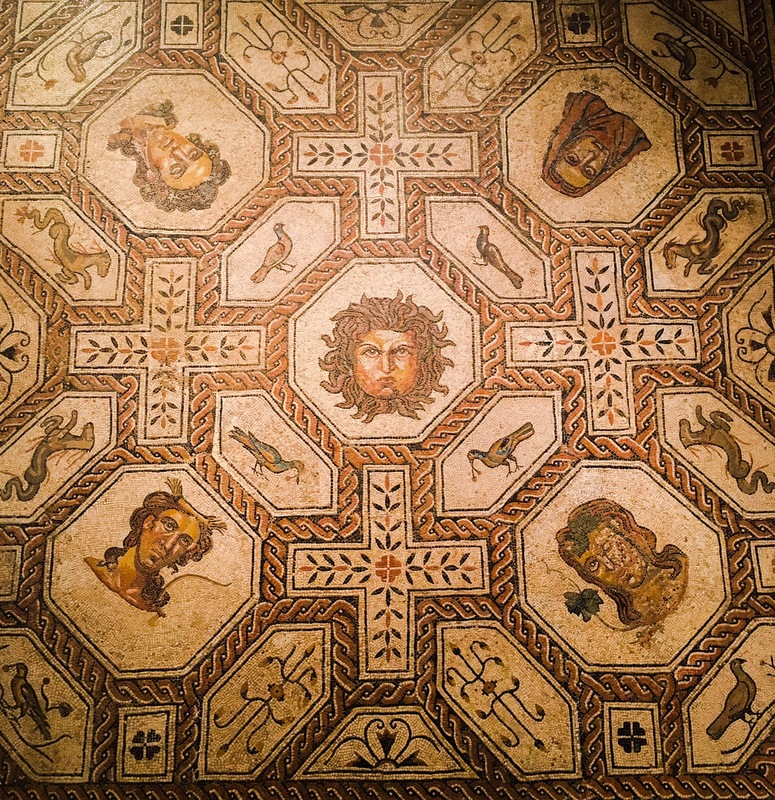 Likewise, this 4th century mosaic of Medusa is a great agricultural calendar floor piece for … rich farmers?! One recurring theme is always Calvary. 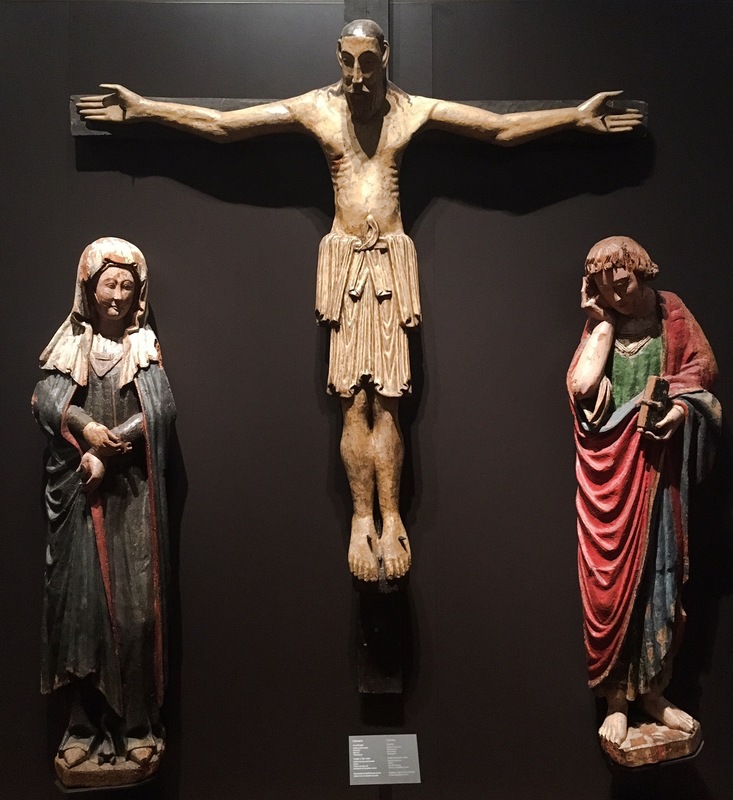 These 12-13th century images are well preserved, but a little too museum-ish for what we have already seen in Camino churches. These gold-gilded and larger-than-life medallions are definitely new to us. 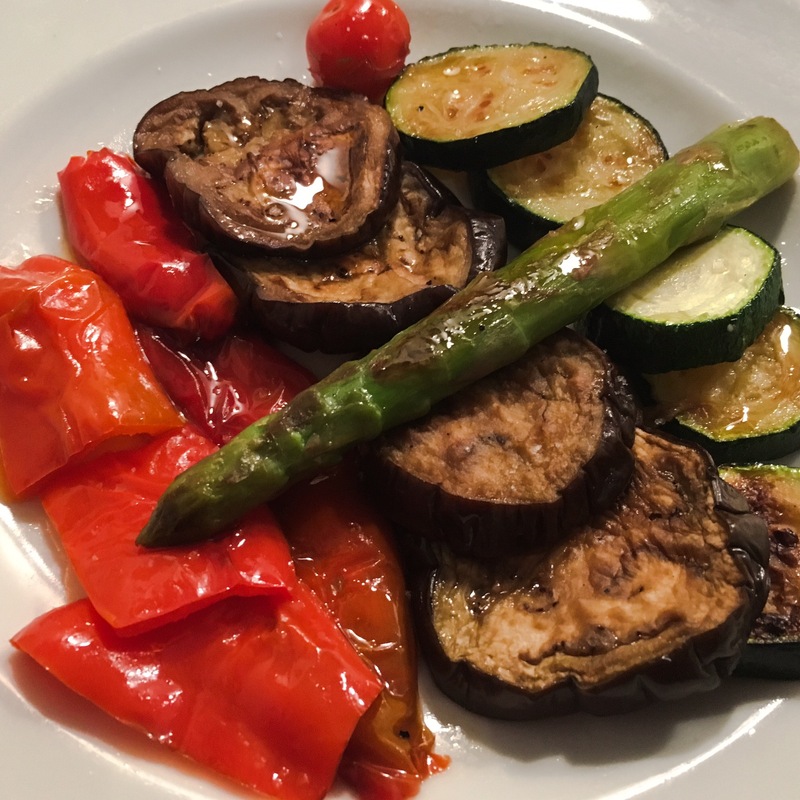 Also new are fresh roasted veggies!!! “Hello, loves – we have missed you. Thank you for being on our 3-course menu today!” Seriously, Mikey has been in a meat coma for 3 weeks now! Speaking of food comas: the “Four Stations” pizza. We have seen this item at many restaurants thus far and finally decided to try it. It’s basically a cheese pizza with 4 ingredients divided into 4 sections. Frank is having bell peppers, shrimp, ham, and mushrooms. So as it turns out, Mikey was gone too long and his boss flew into Madrid from LA to check on him! Actually, Andrea was passing through like the jet-setter she is and we met up this morning. Kinda cool and a great reminder that it IS time to go home. 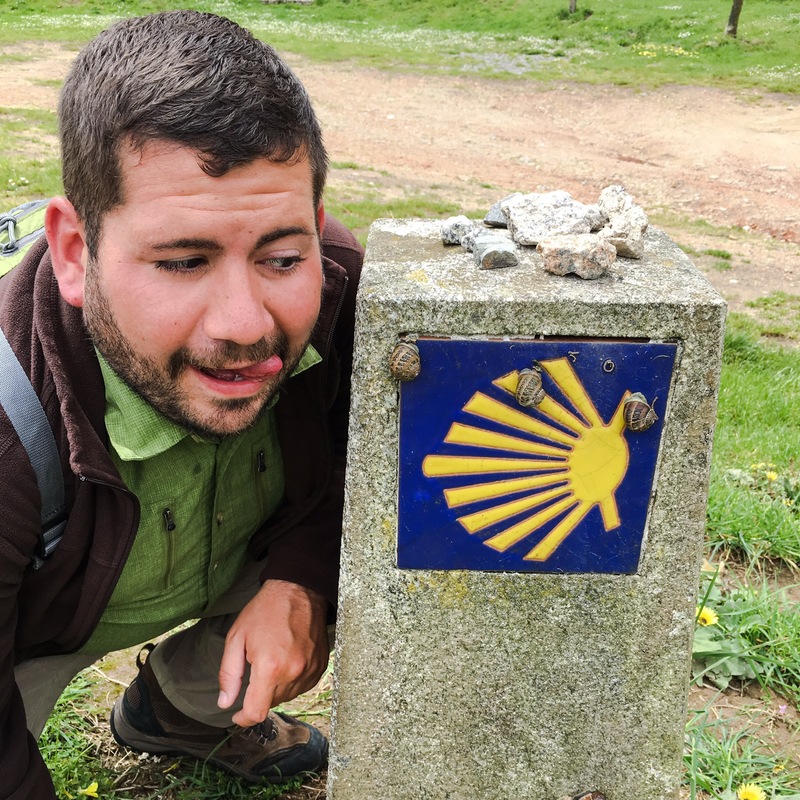 Really though, these big cities have been fun, but with the Camino de Santiago over, we feel like the job is DONE. And then we round a corner. “Saint James Street” is just outside our restaurant tonight. Is it a sign? Is it a pat on the back? Is it like the annoying prevalence of bull-shaped keychains in Spain? This has been a most amazing father-son trip. As Frank puts it,”It is a ONCE in a lifetime trip.” (Note the emphasis on “once!”) Yeah, we’re a little sick of each other, but we’re still talking! Mostly, Frank misses his truck and wife (not necessarily in that order.) And Mikey? Well, Mikey misses cotton! After a month and a half of wearing synthetic clothing, he’s ready for jeans! Seriously, though, it has been a most amazing trip, but here’s to a speedy flight home. The exterior is a mix of 16th century Gothic and earlier Romesque styles. 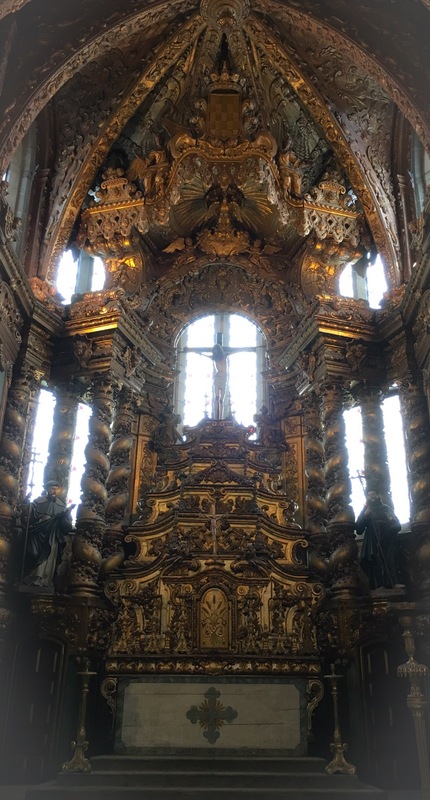 The interior is a VERY interesting blend of artistic styles with Baroque carvings dominating the main altar. This was an curious and graphic altarpiece depicting the slaughter of Christian monks by Moorish invaders. OK, so here’s a little trivia for you: the USA is one of the few countries in which one can “own” a grave. In most of Europe (and the world), one technically “rents” a spot for a hundred years or so. Then, after the body has decomposed, the bones are removed from the grave and placed into an ossuary. This makes room for new tenants. Talk about tight quarters! 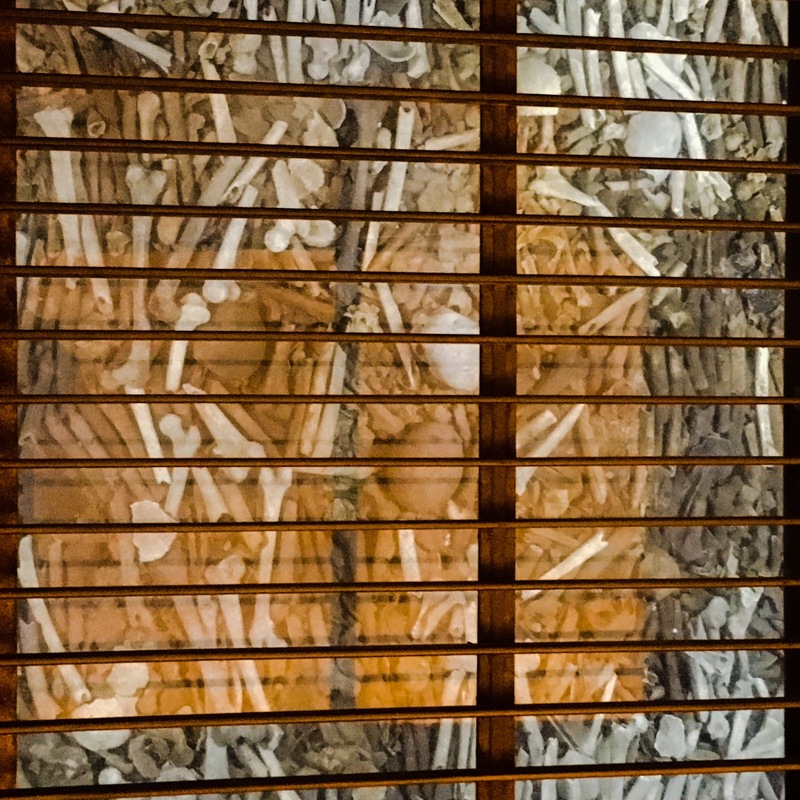 We see the evidence of slum-lord practices by looking through a grate in the floor into this mass ossuary. Enough creepy catacombs for one morning! We headed down to the river for lunch and a tour of Graham’s cellars. Mikey thinks this view of him is just fine! 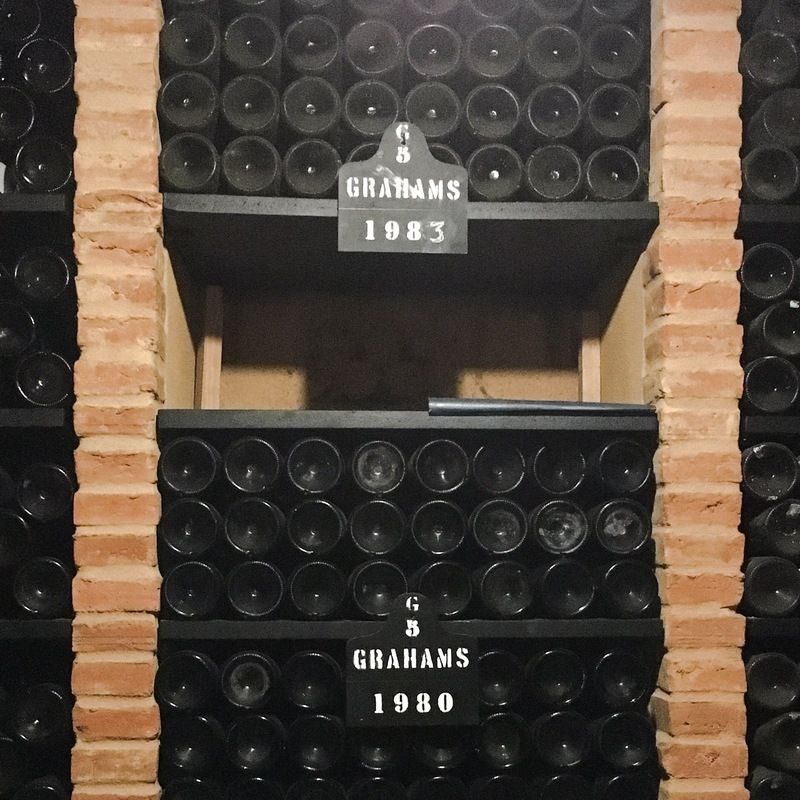 Much of our tour took us through Graham’s cellars and private bottle collection. 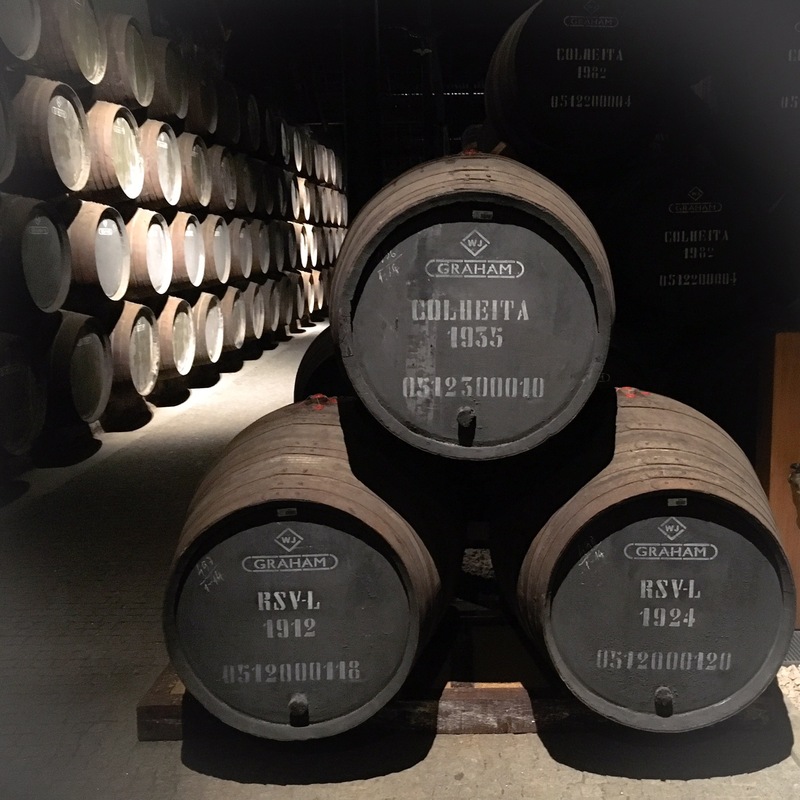 Notice the dates on these barrels – they’re actually storing wine from those years (1912, 1924, and 1935) for use in future special releases! Speaking of special releases…(that’s a shoutout to Kerry Dean!) 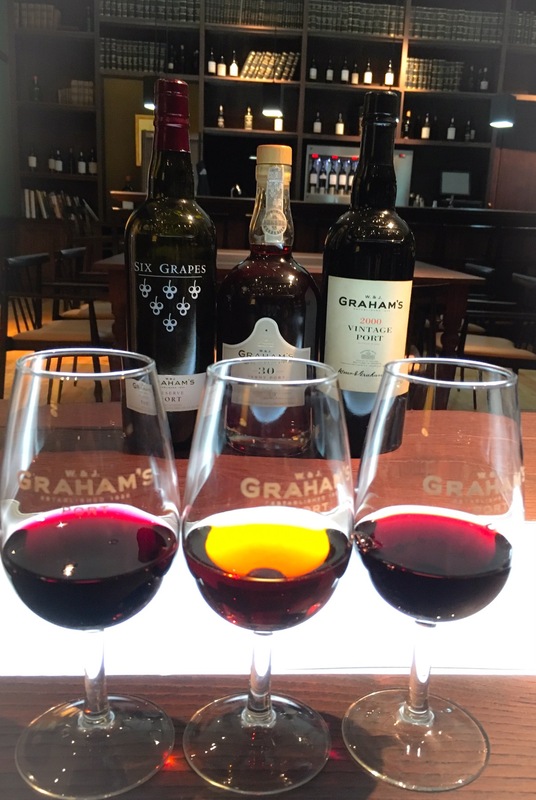 Graham’s keeps their family’s private collection on premise. It contains a hoard of bottles from the most exceptional years. Speaking of exceptional, Mikey got to do a tasting in the “Reserve Library” room following the tour. Oh, and that amber colored one in the middle is a 40 year-old tawny that goes for around $100 a bottle. But, the innocent looking one on the right is more like $150. 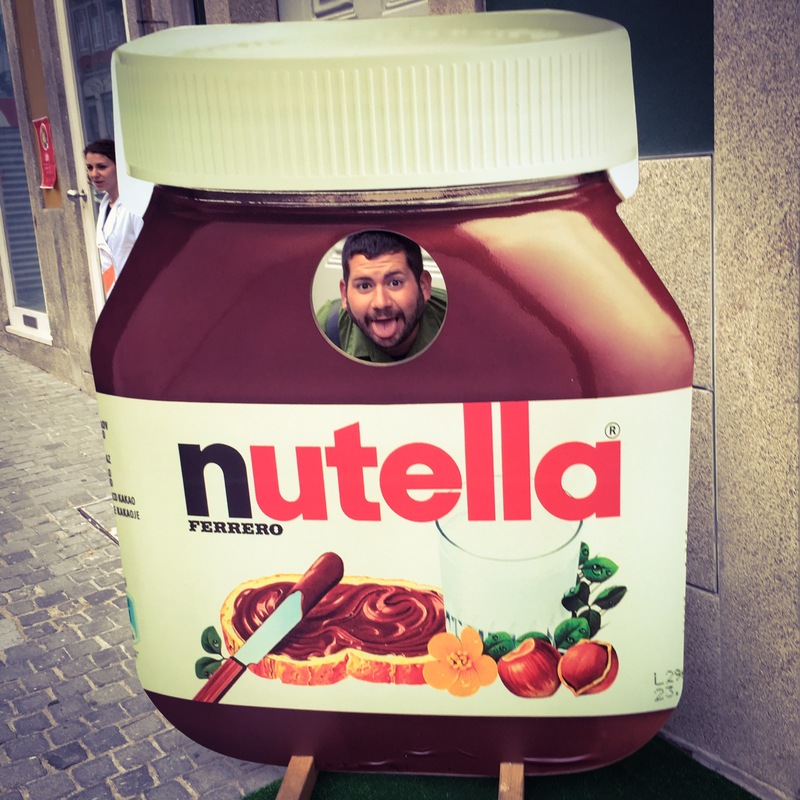 While you probably won’t find these specific ports in the US, Mikey is already planning on bringing some tasty ones to the LA market! 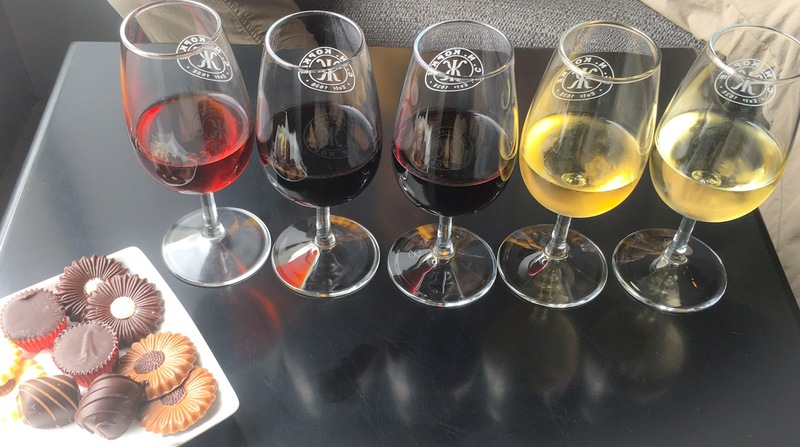 Then there was the port and chocolate tasting at Kopke – the world’s oldest port house. 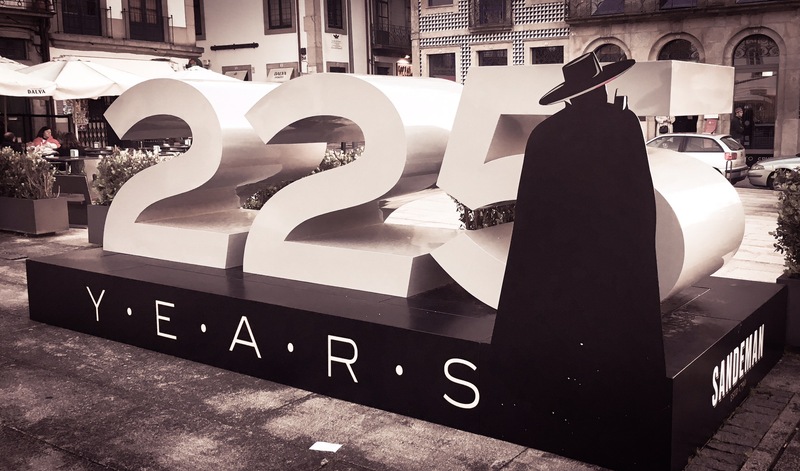 Yeah, maybe a bit risqué for some Porto-ians. Ok, words simply fail at times like this. 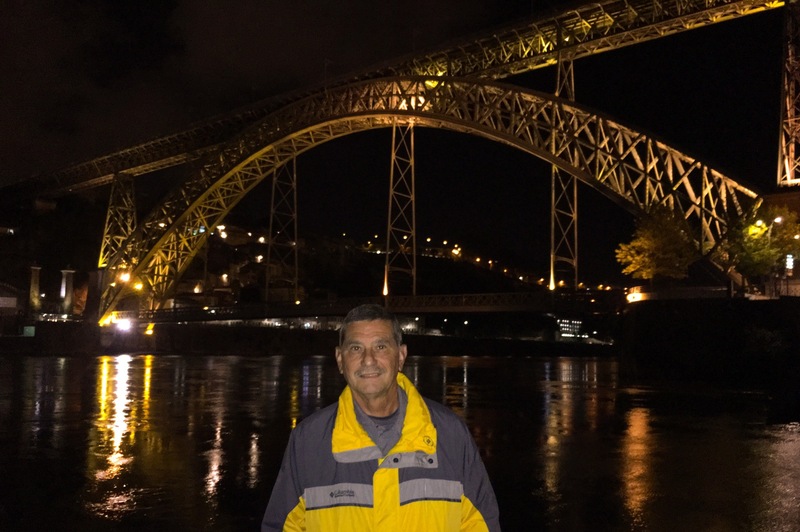 We wrapped up the day near Porto’s famous bridge. Sure looks fancy at night! 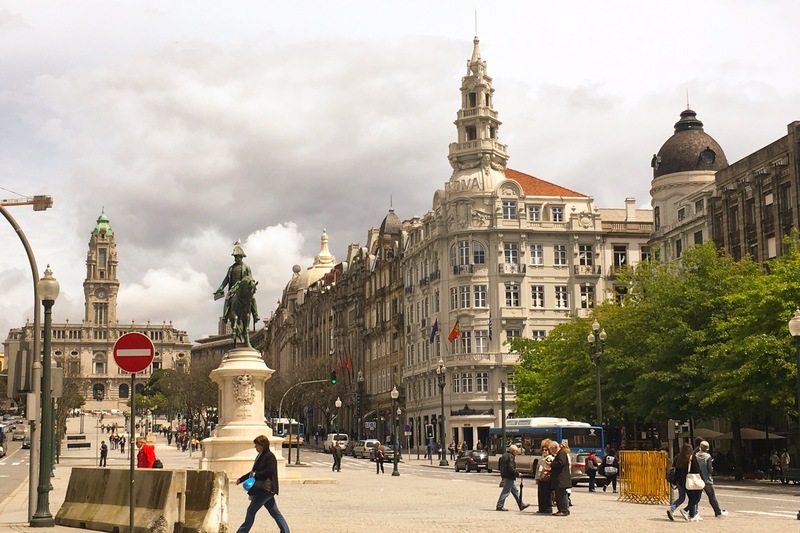 Well, good night and goodbye Porto. “We’re leaving on a … Graffiti Train!” Yeah, still not sure if the Portuguese trains are actually graffitied or if it’s just a bad paint job. Anyway, we’re headed back to Spain aboard this diesel beast! Hasta pronto. 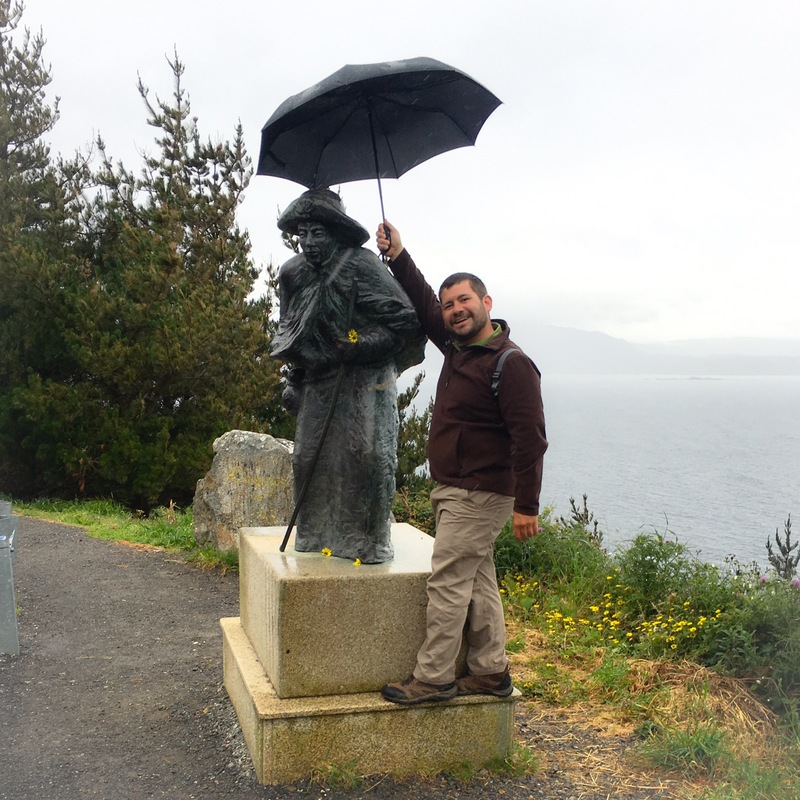 We returned to Santiago de Compestella from the end of the world and said our goodbyes to Saint James. 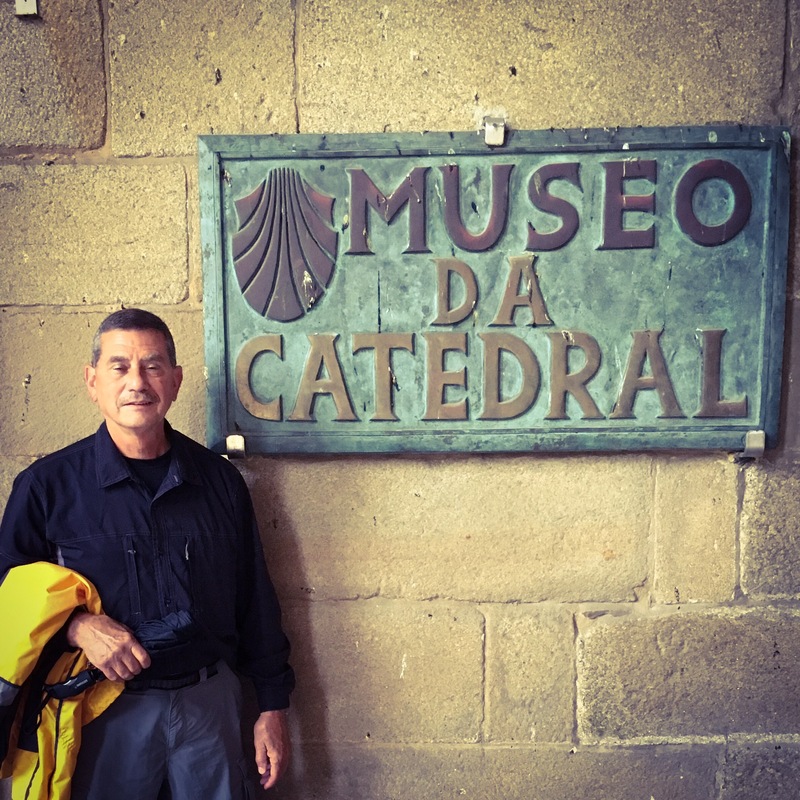 With one last walk around the cathedral, a final farewell to his remains below the altar, and a visit to the cathedral museum, we finally parted ways with the city. 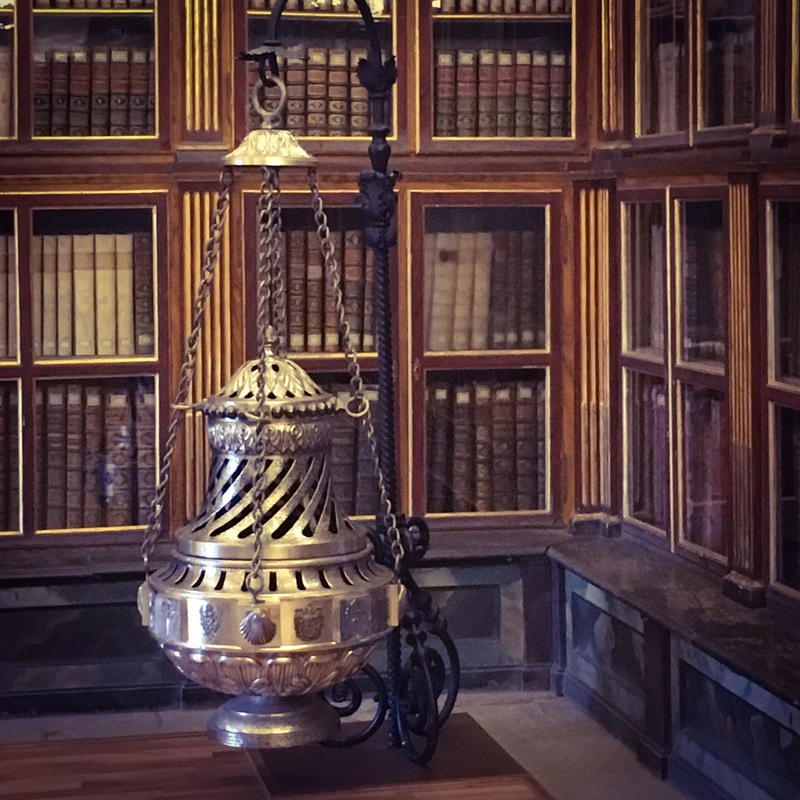 The “spare” botafumiero on display in the cathedral library. Mikey really likes ringing bells! On the real though, look at the size of these!! 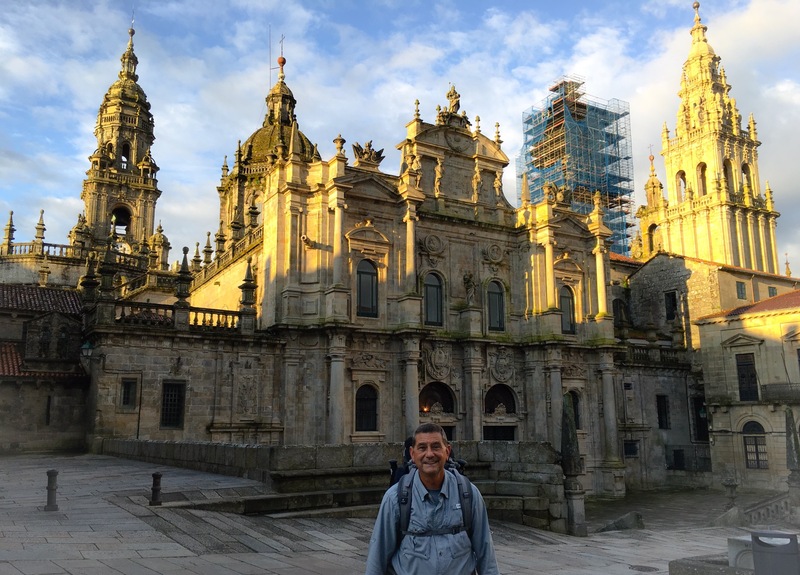 It was, however, a bittersweet departure from Santiago as this city has for so long been our ultimate Camino destination. Still, we once again packed our bags and headed off for parts unknown. 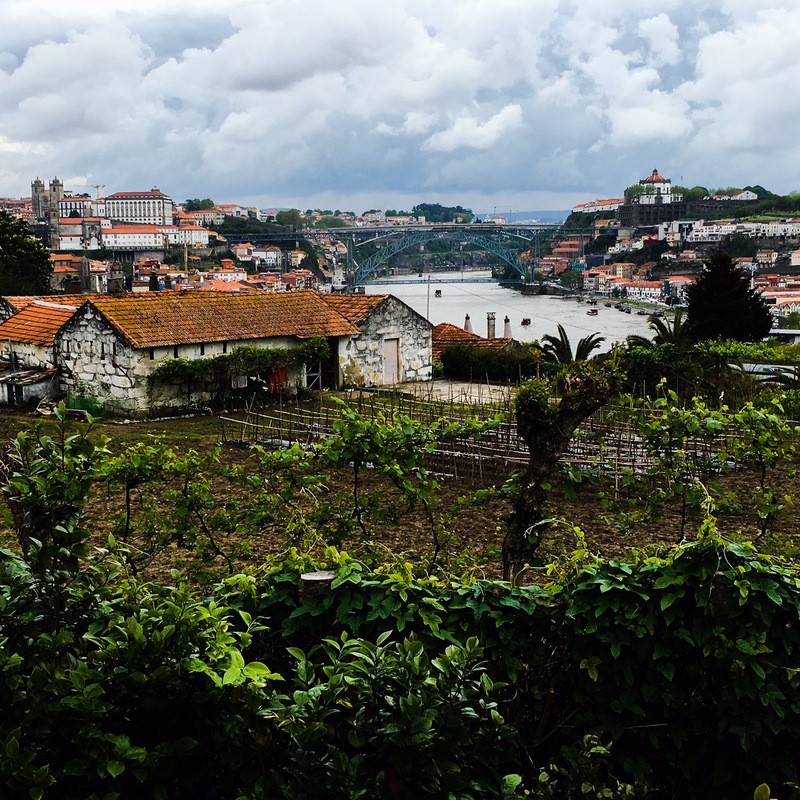 Porto, the major city in the north of Portugal, is known for its dessert wine and ceramic goods. As it has close economic ties with Great Britain, English is an extremely common second language. This is a good thing as neither Mikey nor Frank speak ANY Portuguese! Moreover, Mikey’s Spanish is useless due to centuries of bad blood between Spain and Portugal. For instance, restaurant menus are normally written in three languages: Portuguese, Engligh, and French. (Don’t even try speaking Spanish!) Likewise, weather maps on Spanish news broadcasts show a gray area where Portugal should be while Portuguese stations similarly blot-out Spain. Like a trailer park brawl, it’s best to just stay out of it! 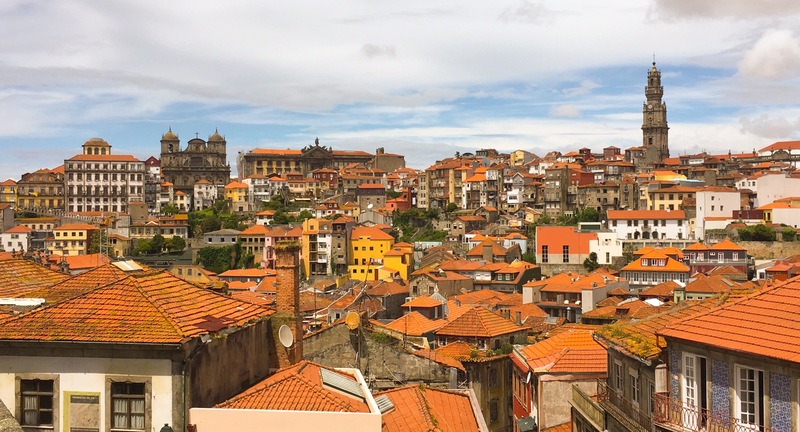 So…here’s a nice view of downtown Porto! 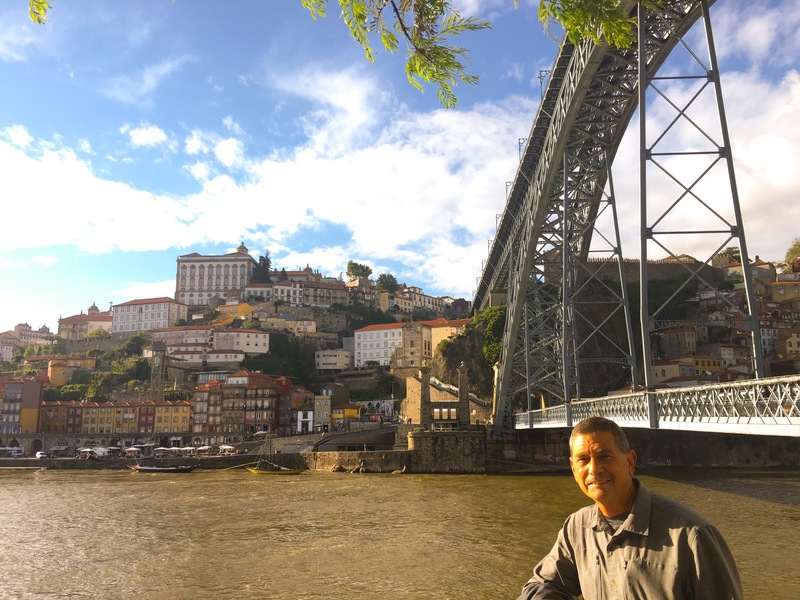 Mikey and Frank took turns posing in front of the Dom Luis I Bridge. 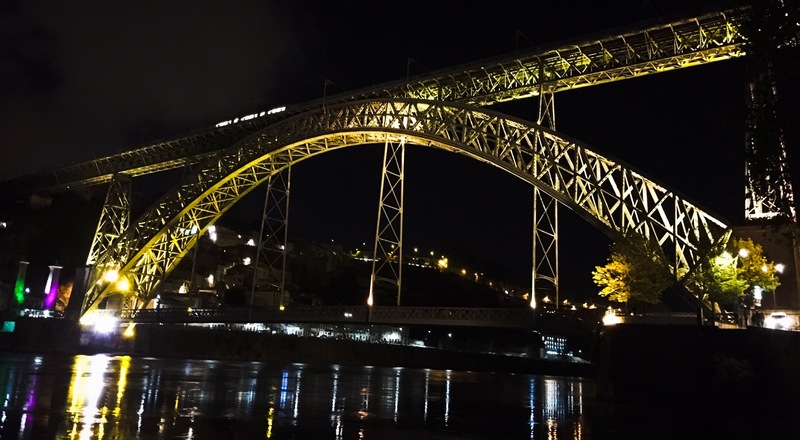 It’s a double-decker metal bridge that has become quite iconic for this city. Oh yeah, we walked across both levels for good measure. Just can’t seem to get away from the churches! 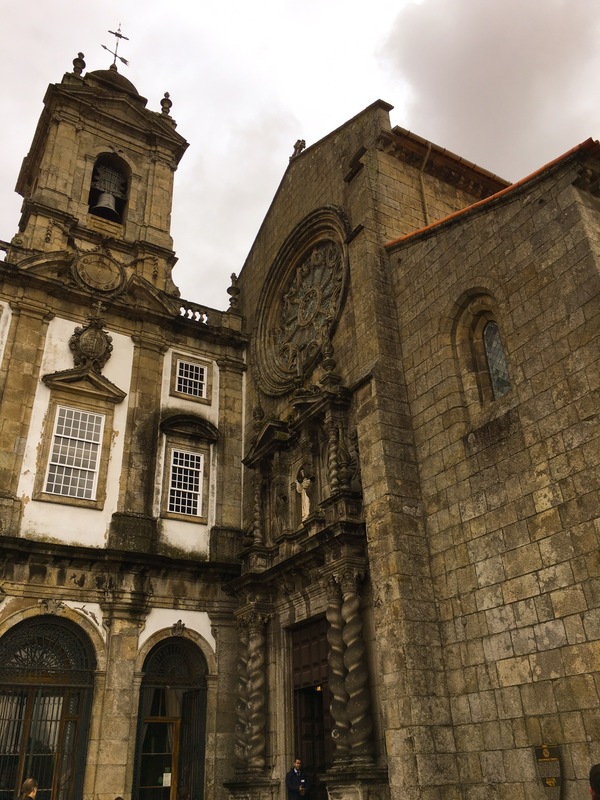 This is the Sé Catedral of Porto. 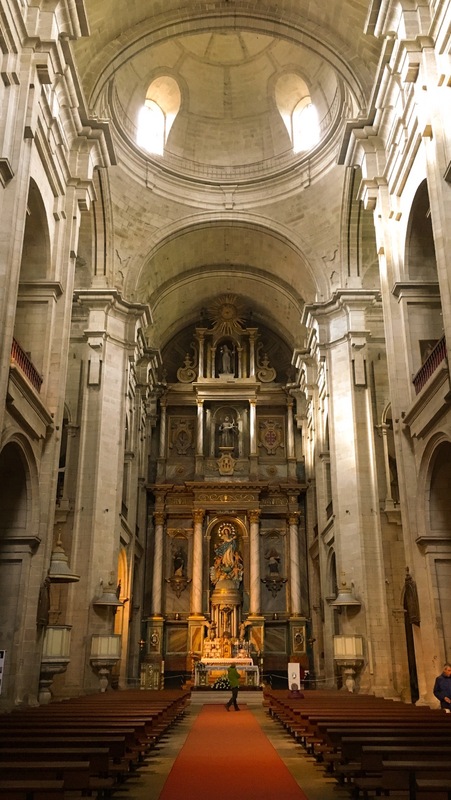 It’s a pretty standard romanesque cathedral with thick walls and narrow slotted windows. Franks thinks Mikey has taken enough pictures of churches to last a lifetime. Mikey reminds Frank that we are on a Catholic pilgrimage. One more pose below the iconic bridge. 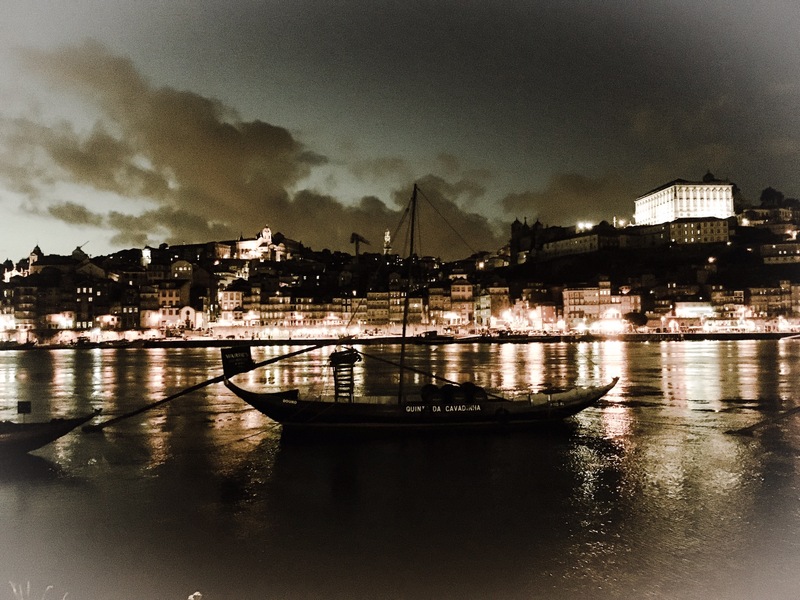 Well, we bid you adéu with a shot across the bay. Prominent in the foreground is a Rabelo boat. 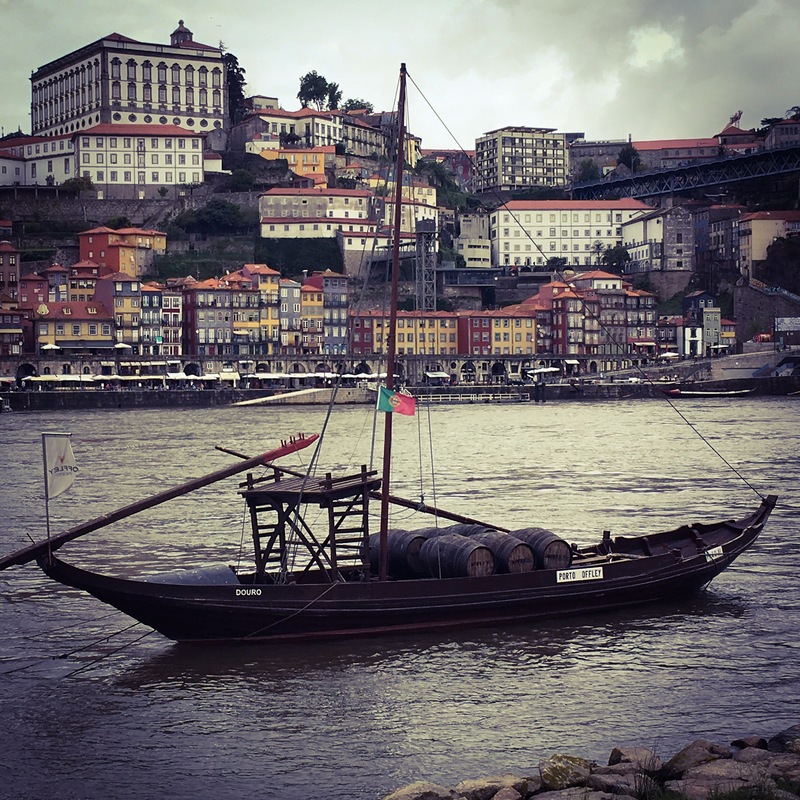 This style of small river cargo vessel was designed to transport barrels of port wine downriver to the larger cargo ships that would export Porto’s finest to all parts abroad. Frank and Mikey just walked home. Anywho, we’d better sign off for the night as we lost/gained (?) an hour today (look it up, Portugal is 1 hour ahead of the rest of Europe.) Let’s just say that Frank and Mikey are e an extra hour tired. ¡Tchau! We have walked enough. 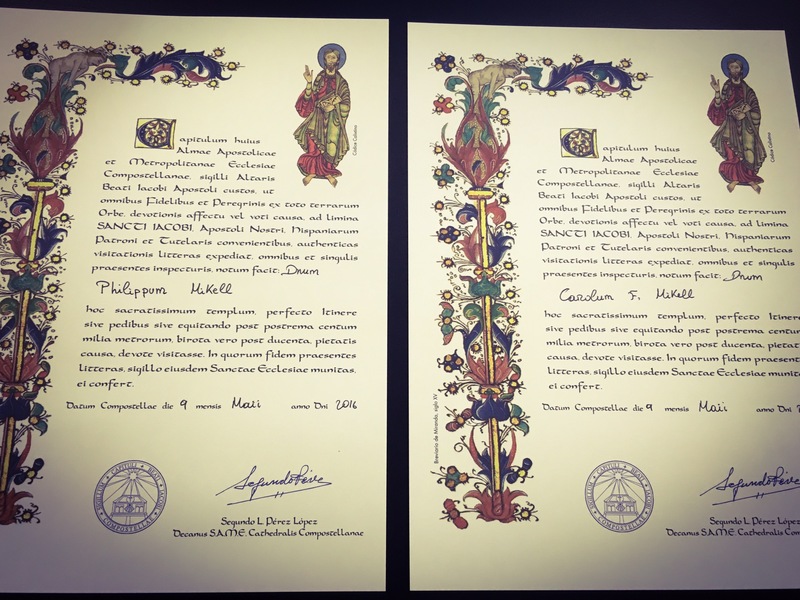 In fact, both Frank and Mikey have certificates from the Catholic “powers that be” stating their grand total of 775km (482 miles) walking over the last month. As such, we took a bus today! 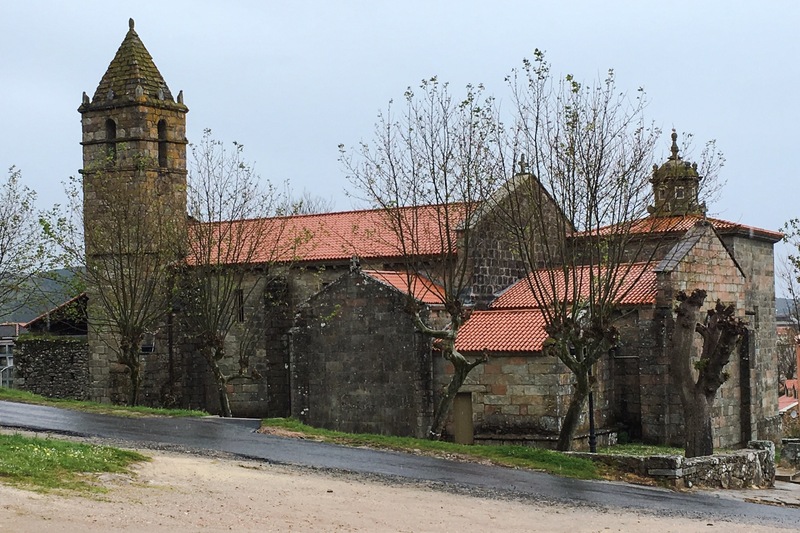 We traveled from Santiago to Fisterre and arrived by lunchtime. Yeah, that’s a happy camper! 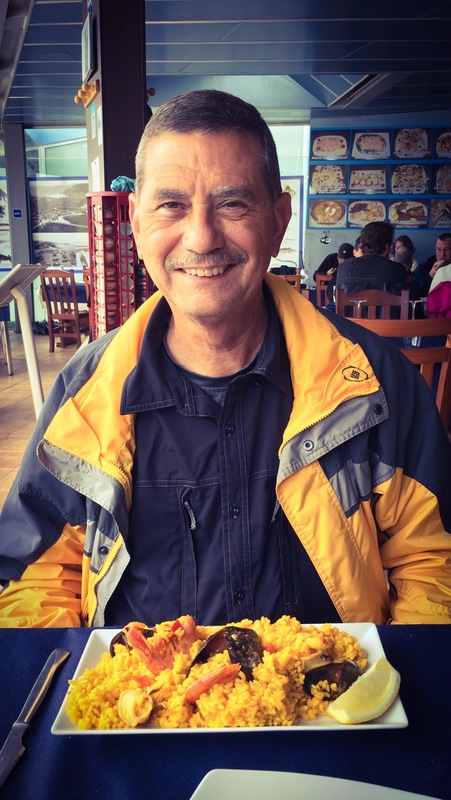 Frank loves paella – especially seafood paella. Following lunch, we walked up the coast. This bird just wanted to join in for a picture. Lunch was great, but Mikey was still craving some Camino escargot! On the real, though, we have no qualms about ordering snails at a restaurant. Still, the idea of stepping on one is paramount to murder! Why is that? Maybe we don’t want to waste food?! 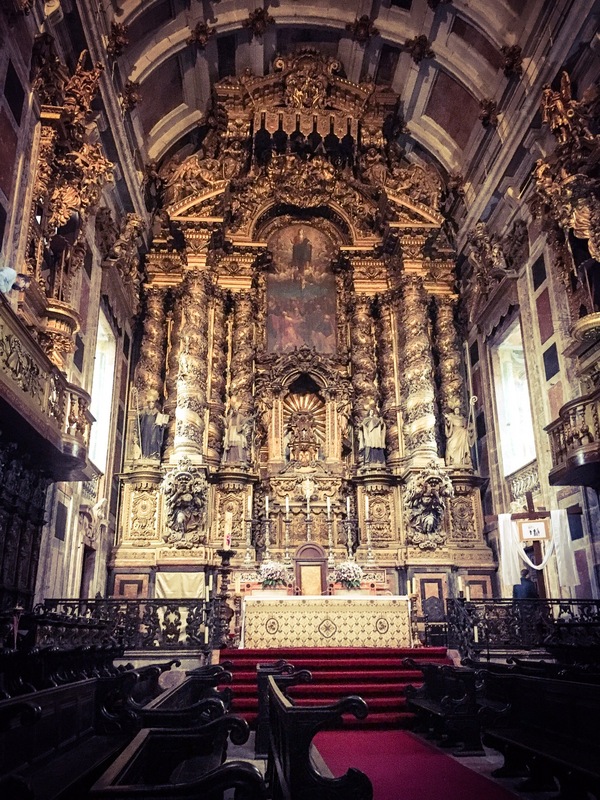 This is the local parish church in Fisterra. “King of the Mountain” (if any of Mikey’s former 3rd grade classmates are keeping score.) Sorry, but he had to go all colonial on this pic! Wait a sec, looks like Frank made it! 0.0km probably means that we’re done!! This is the “End of the Earth.” Yeah, there’s only a small cross marker, but we’re just glad to have finally made it. Oh, and we got to celebrate once again! 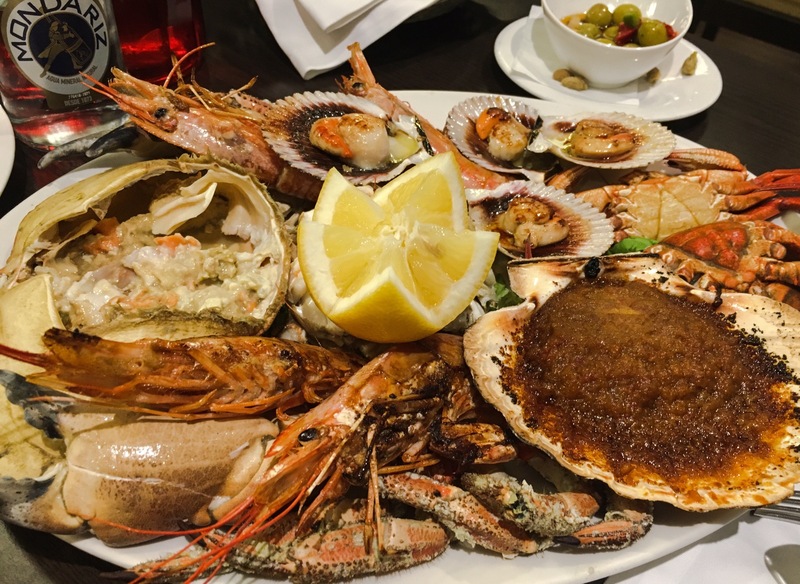 Yeah, that’s LOTS of shellfish. Well, gotta put this away, so we’ll have to post more soon. Un embrasso fuerte. At long last, we set out for our final day on the trail. Given our close proximity to Santiago, today was a short walk downhill into the city. This is the skyline leaving our “Mountain of Joy.” Prominent on it is a monument celebrating Pope John Paul II’s visit in the 1980’s. “Looks like we made it!” Some 5km later, we arrived in Santiago de Compestella. 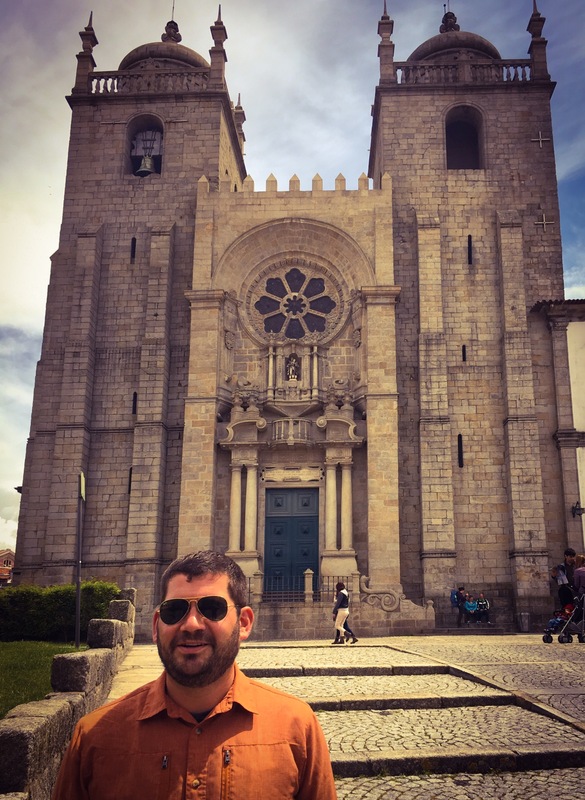 Our first stop was (naturally) the cathedral in front of which Frank is posing. Then, it was on to a quick breakfast. 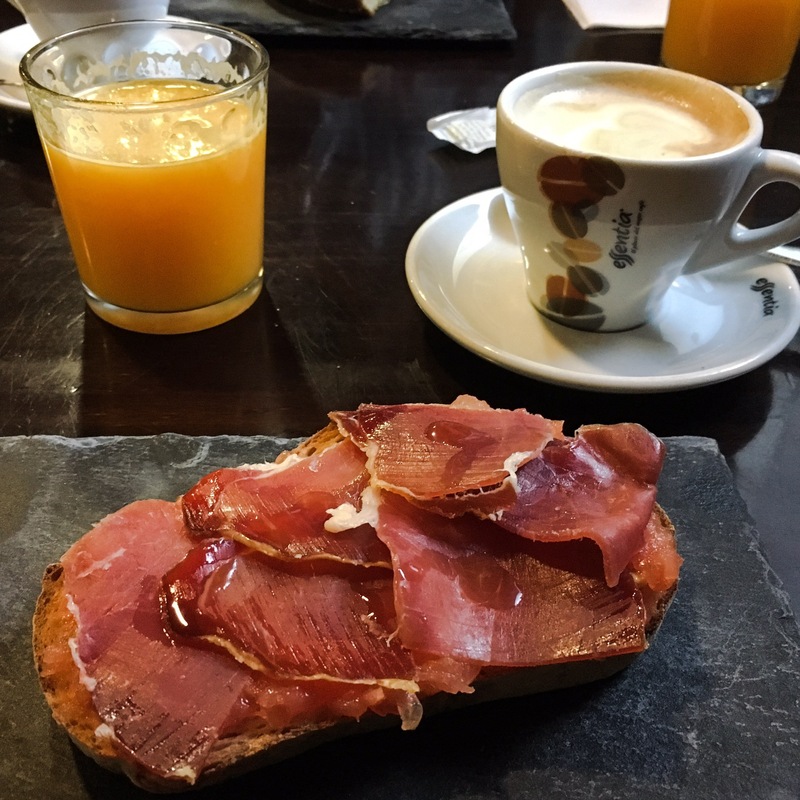 Mikey has yet to tire of bread and pork, so he ordered toast with tomato and Iberian ham alongside his usual “cafe con leche” and fresh squeezed orange juice. 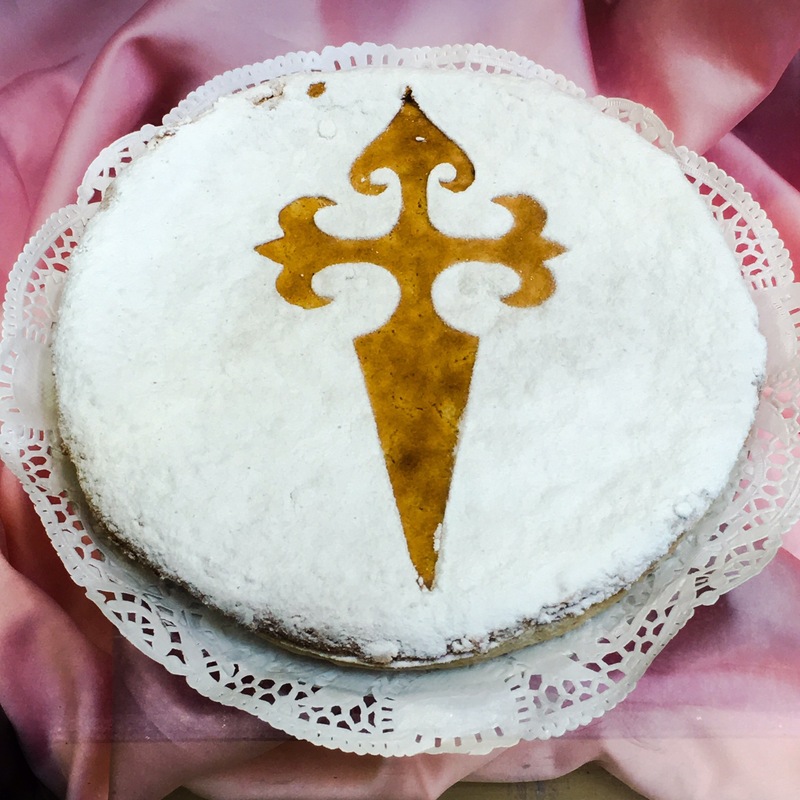 Frank imbibed our normal regimen of coffee and juice, but mixed it up a bit with a “Torta de Santiago.” This is basically an almond coffee cake with powdered sugar on top. A Saint James’ cross cutout is placed on top and creates a decorative relief. Having arrived so early, we had plenty of time to explore the cathedral prior to the noon pilgrims’ mass. Mikey had to pose in front of the main sanctuary. 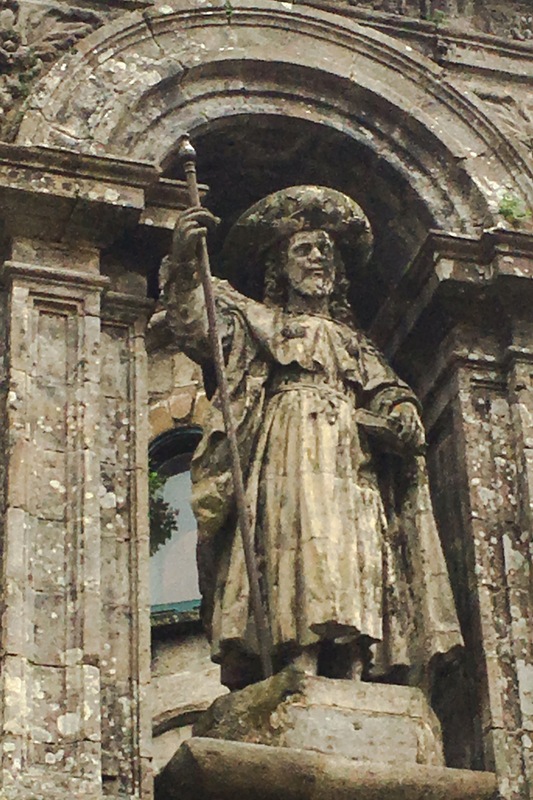 This exterior statue depicts Saint James (one of the 12 disciples) in his usual pilgrim garb. It was in these cloaks that he spread the gospel in Galicia during the 1st century CE. 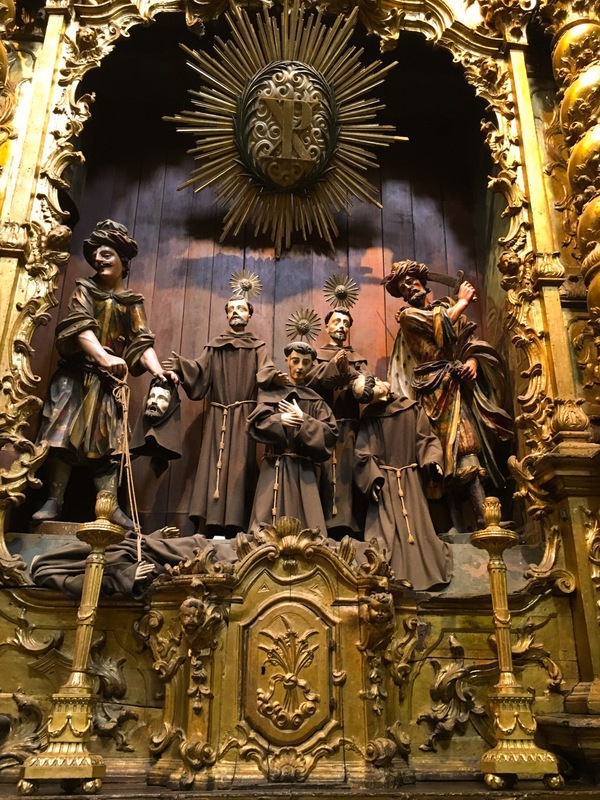 This is an interior statue within a small chapel depicting Santiago Matamoros. 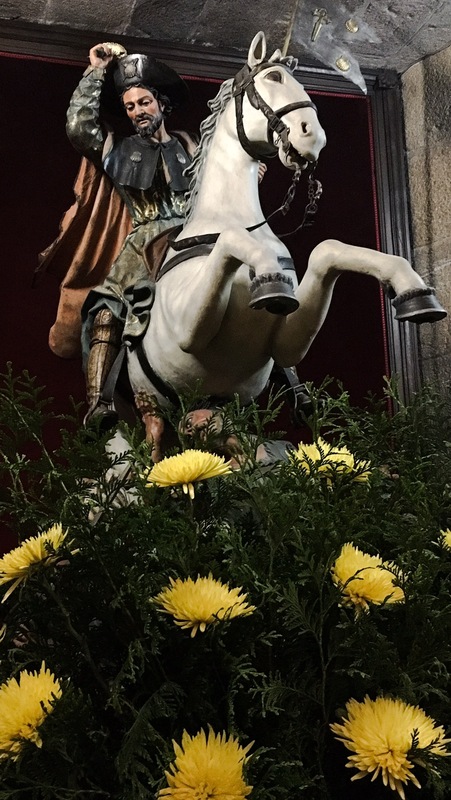 According to legend (and it is JUST a legend), during a 9th century battle with the Moors, St. James appeared on on a white horse and led the Spanish to completely slay their Muslim enemies. Ergo, our humble evangelist and disciple of Christ was transformed into a militant warrior who sided with the Spanish over the Moors. Whomever James the Greater was, his remains are allegedly housed in this silver box beneath the altar. Mikey and Frank discussed their existence several times during our walk. 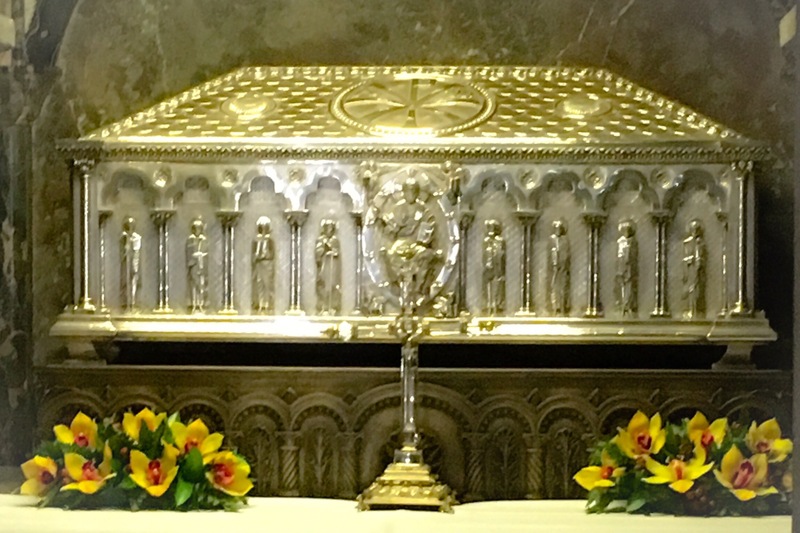 Basically, Mikey asked two questions: 1) are the remains of St. James actually preserved in a silver box below the altar? 2) Does it really matter to us? We will probably never know the answer to the first question. As for the second, it is really a matter of perspective. 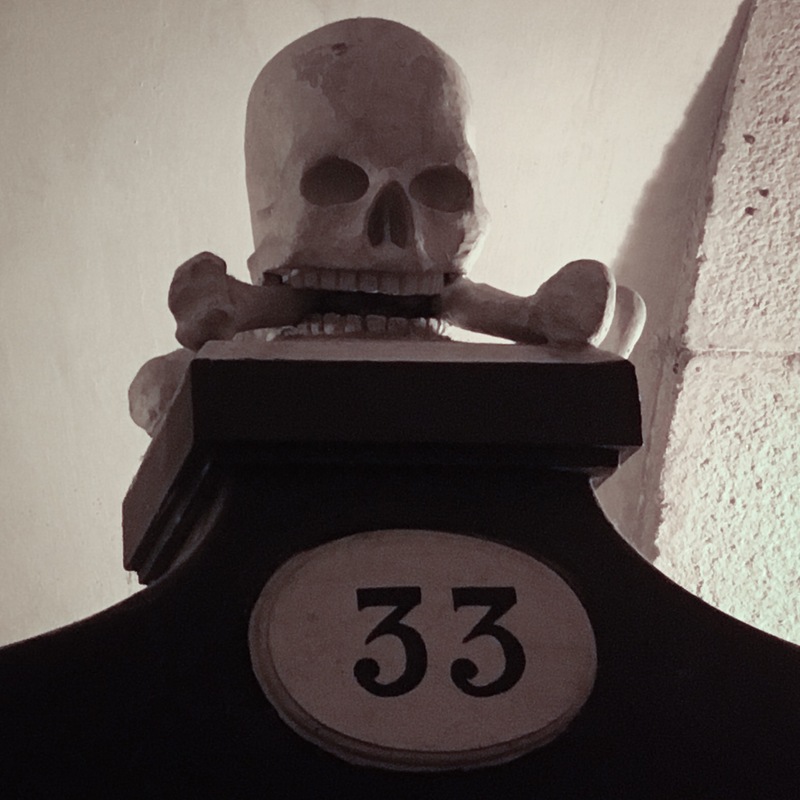 But this voyage was never about Saint James or where his remains … remain. (Sorry, couldn’t help that pun.) How sad it would be to have our linchpin of success be so outside of our control! 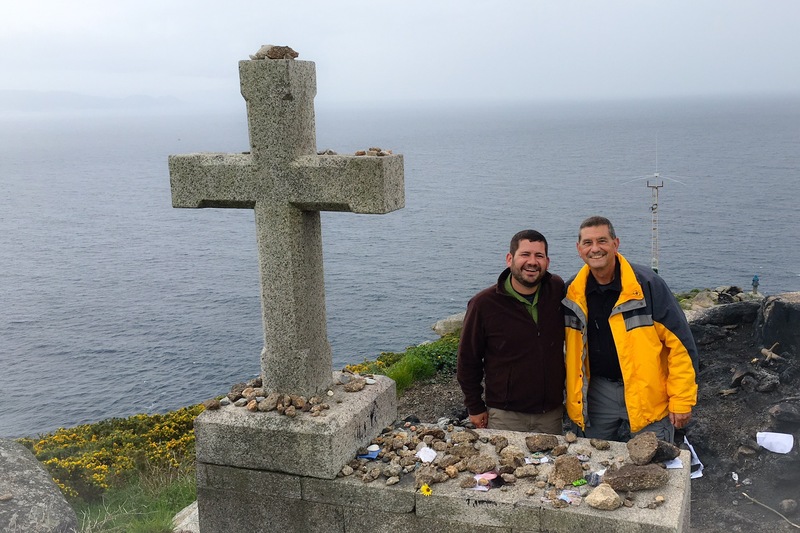 Rather, the pilgrimage was an excuse to take a walk together – as father and son. Yes, we made it; yes, we arrived in Santiago. But our success is demonstrated in our continued companionship – we still like each other! But think about it: who can say that he has walked a mile in his son’s shoes or 500 in his father’s? 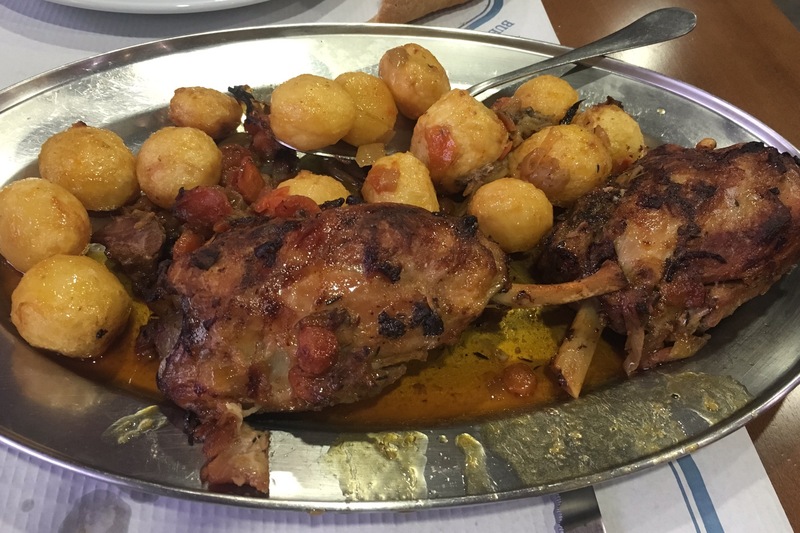 This is the true gift that the Camino bestowed on us. 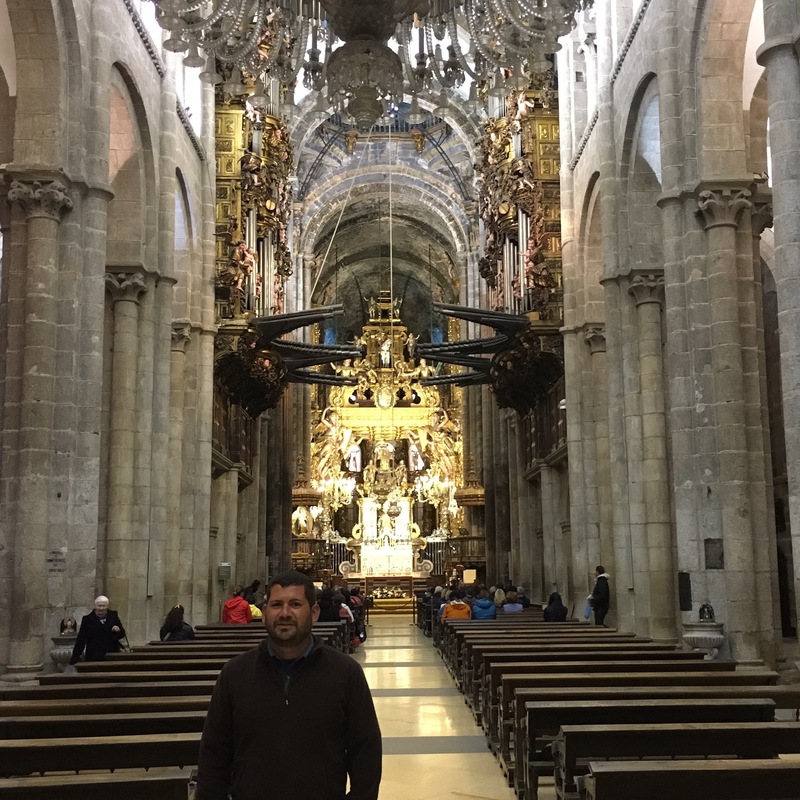 Meanwhile, we got to explore a lot of Santiago and the cathedral especially. Here’s the top secret photo that Mikey clandestinely snapped from behind the altar. Totally forbidden and totally awesome! 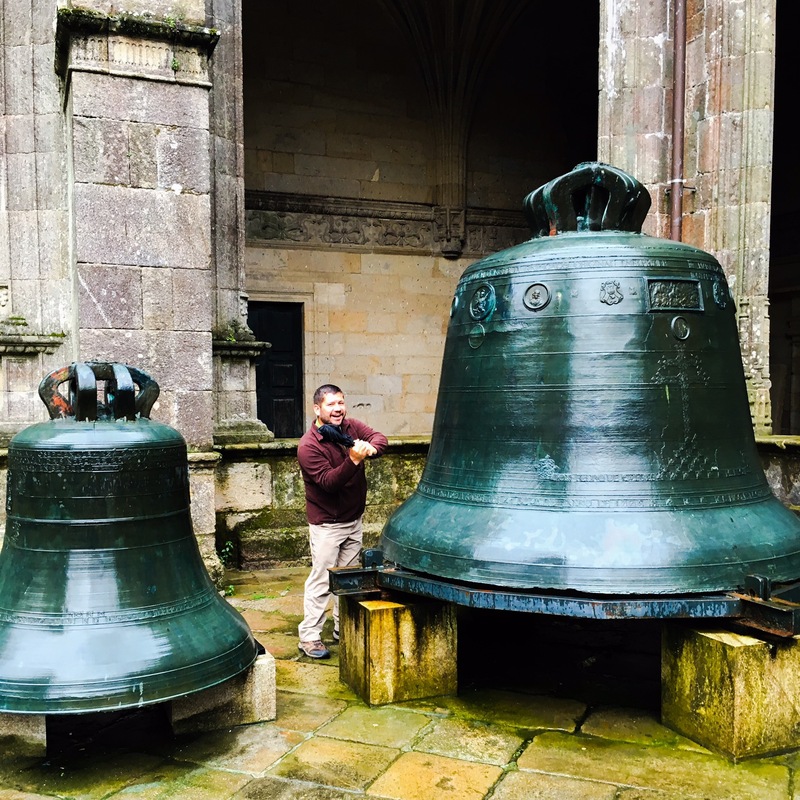 During the medieval period in which the Camino was most popular, the cathedral priests of Santiago devised an ingenious method through which they could fight the “pilgrim stench.” A large incense burner known as the Botafumeiro was lit and swung through the cathedral during part of the mass. We were quite fortinate to witness this waning ritual at the noontime Sunday mass. We also visited a Franciscan monastery that was nearby. Its altar was surprisingly high. Oh, and we had some great food! 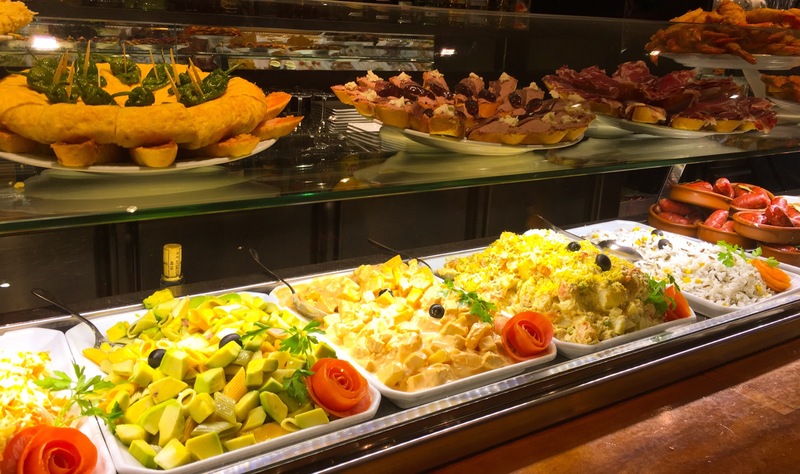 Santiago is home to a vibrant pincho/tapa culture in which one can sit at a bar and snack on many different types of food. 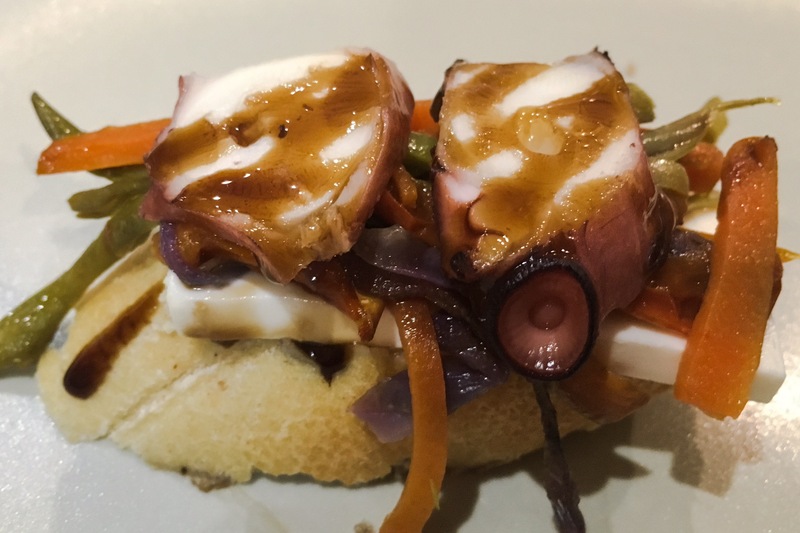 This was a VERY tasty octopus pincho with cheese and veggies on bread. But that was just a starter. 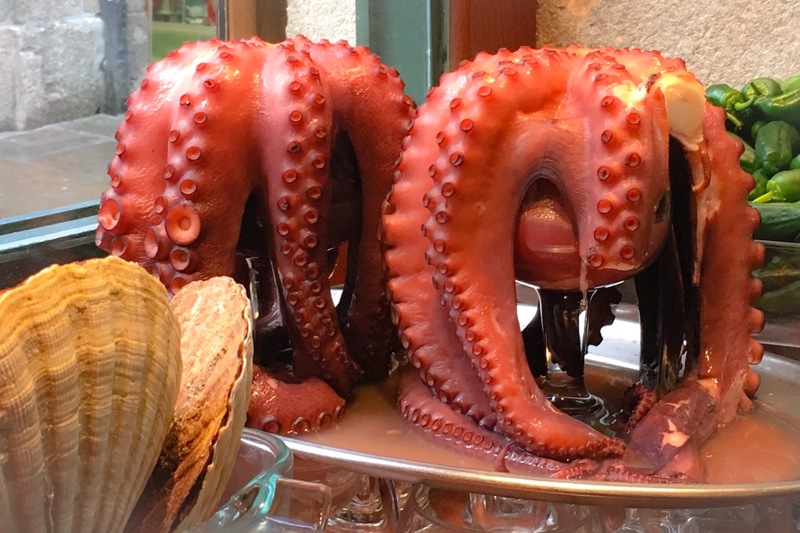 Come on, when you’re in Galicia, you gotta do seafood – right?! Yeah – we HAVE arrived! So what now? Well, Mikey once told Frank that he’d walk to the end of the earth for him. Tomorrow will be that day. 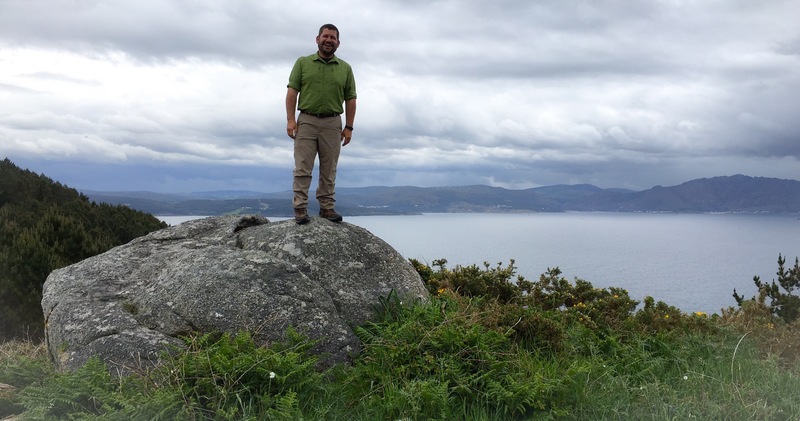 We depart early in the morning for Fisterra (Finisterre) which is a derivative of the Latin “Finis Terrae” or End of the Earth. Yeah, that Mikey is true to his word! ¡Tchau! We got off to an early start, and covered quite a few miles before breakfast. Our major goal today is to cover some 40km (24+ miles) in order to arrive in Monte de Gozo (Mountain of Joy) by tonight. 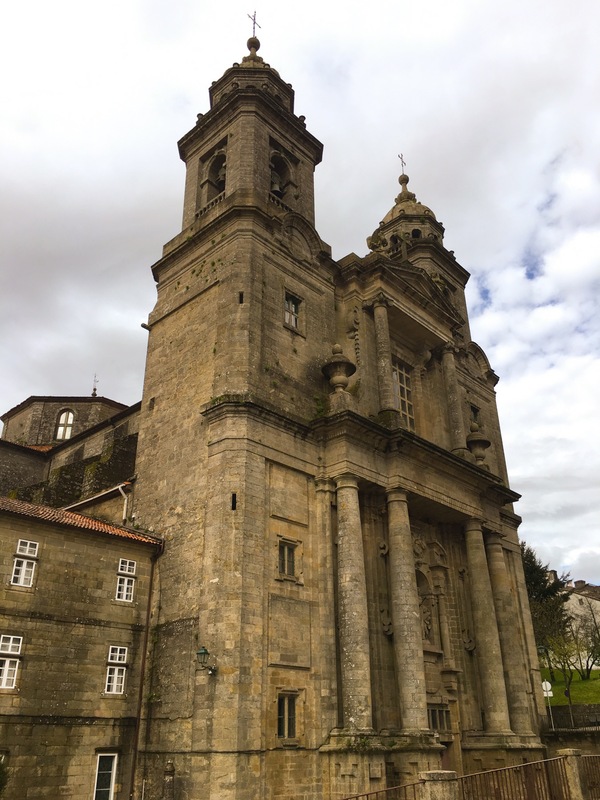 This will put us some 5km from Santiago at our ending stop tonight and allow us to walk leisurely downhill on Sunday morining for noontime Pilgrims’ Mass at the Cathedral. Step aside, Waffle House, this girl’s got breakie going on! We ordered eggs, bacon, ham, toast, and fresh-squeezed orange juice. 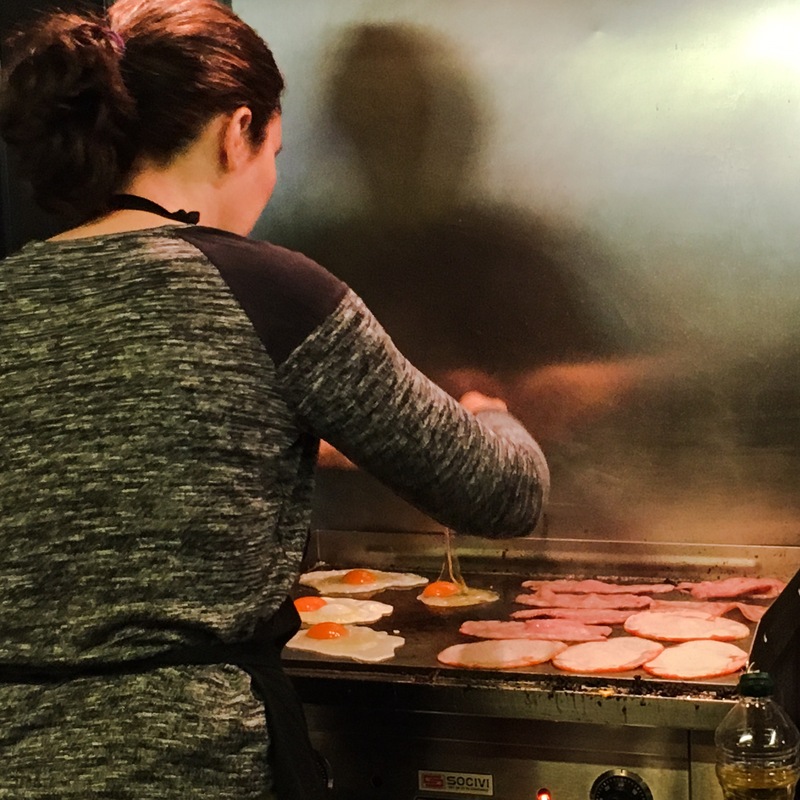 All that on the griddle – yeah, that’s for us two! Oh, and you ask about price? 9€ total. Yeah, Spain rocks! 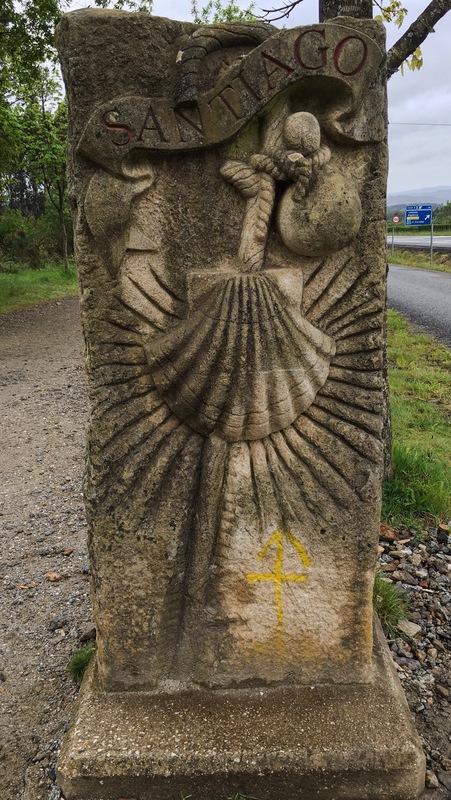 Not sure if we’ve posted about these yet, but they are all over Galicia. This is basically a corn-drying hut that is raised above the ground to prevent rats from eating the stores and narrow slats to prevent birds from doing the same. 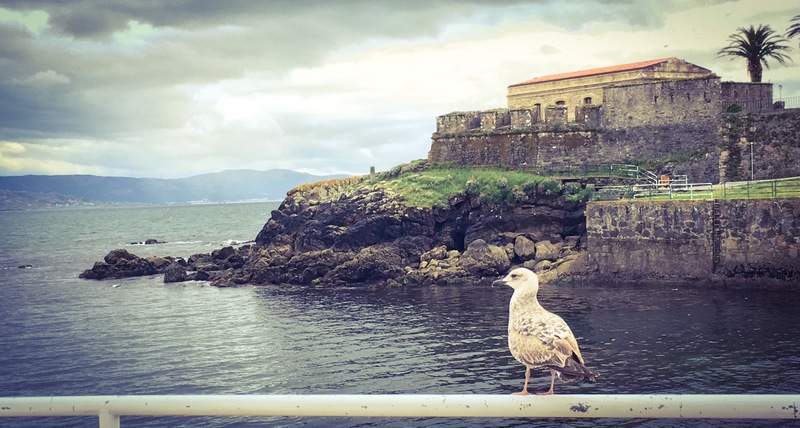 They can be constructed of wood, brick, or stone, but all serve the same purpose and are everywhere in Galicia. 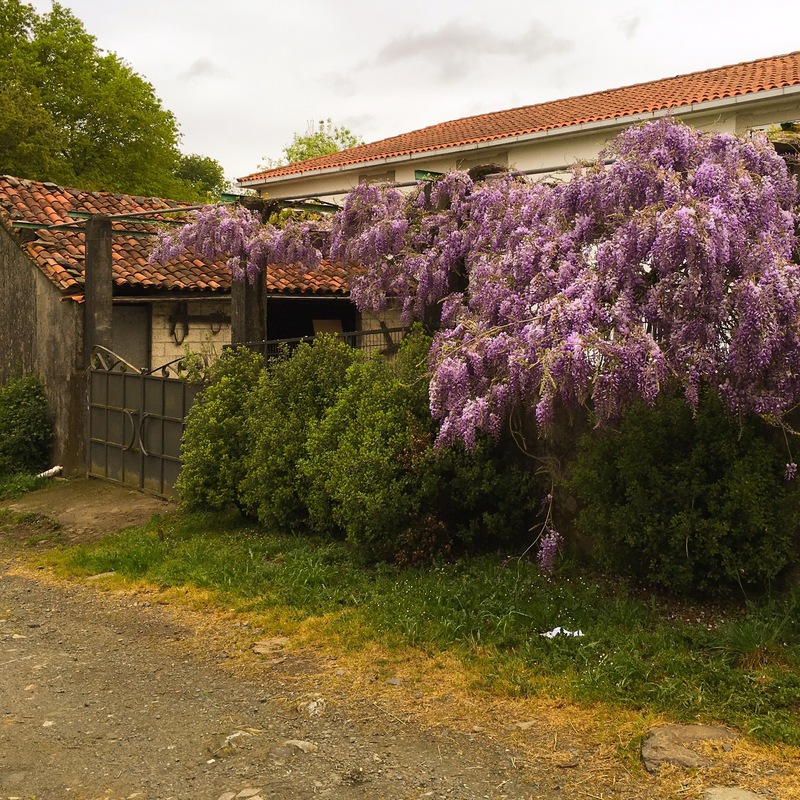 Wisteria is now in bloom all over the northwest of Spain. It’s funny how, just a month ago, we were trudging through a snowstorm and are now almost sickened by the sweetness of flowers in bloom. 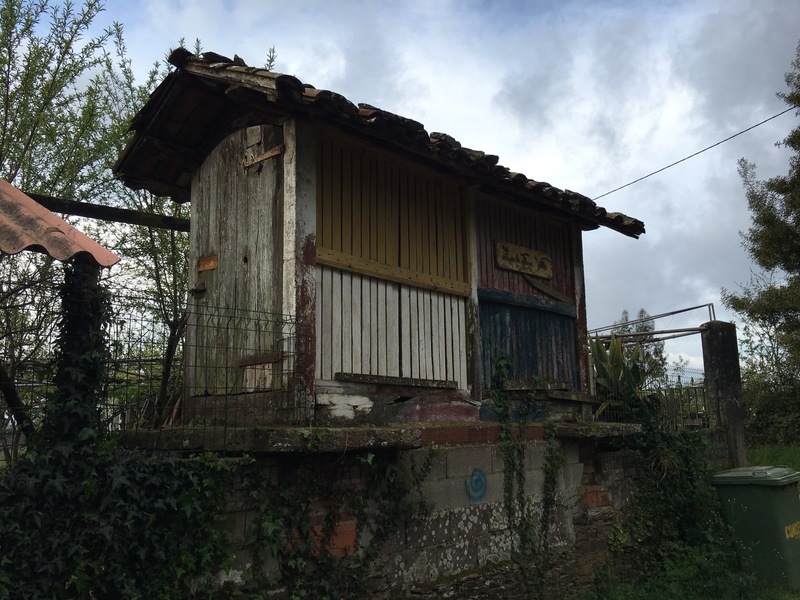 According to our guidebook, we were supposed to stop in the town of Pedrouzo. Instead, we trudged on through the mist and rain, opting for a forest route over that of the tempting town. 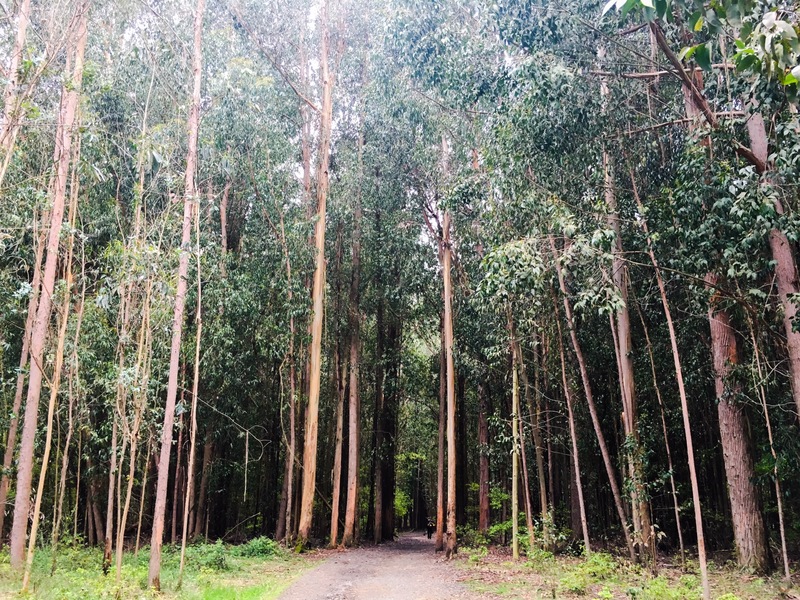 This eucalyptus forest was really amazing. Frank called it an “enchanted forest” while Mikey had “Into the Woods” songs stuck in his head for way too long. Awesome marker, right? Yeah, we encountered this about 200m from the airport in a downpour. Santiago is close, but will we make it?! At long last, we arrived in Monte de Gozo (Mountain of Joy). 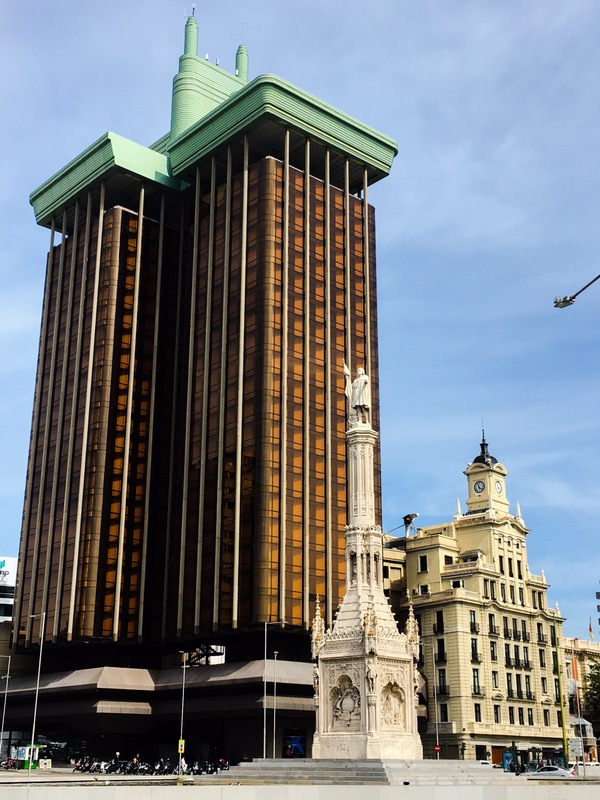 From here – on a clear day – one can see the towers of the cathedral in Santiago. No such luck. Instead, we put on our rain suits and headed out for dinner. This was the main course. We began with a chicken noodle soup and then shared this platter: roasted pork leg with potatoes, carrots, onions, and garlic. Wine for Mikey, a Coke for Frank, amd two lattes later, we were set back by 16€. 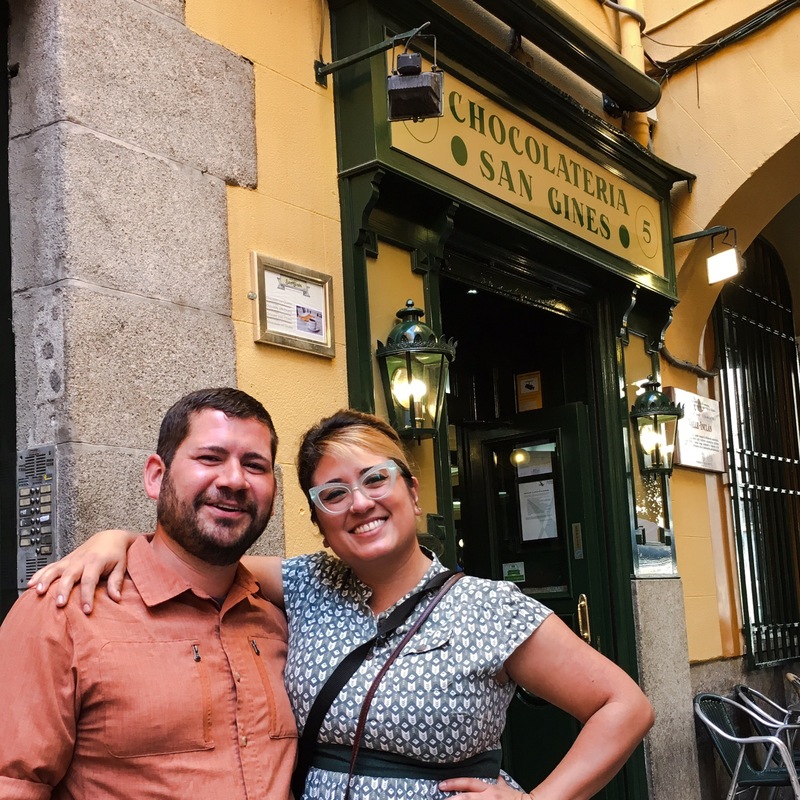 (For our slower readers, Mikey IS MOVING TO SPAIN!!) Perhaps a joke now, but the prices are such that we have been able to indulge without any worries. It’s actually laughable how inexpensive some meals are. Well, we sleep now on full stomachs. Tomorrow is another day. 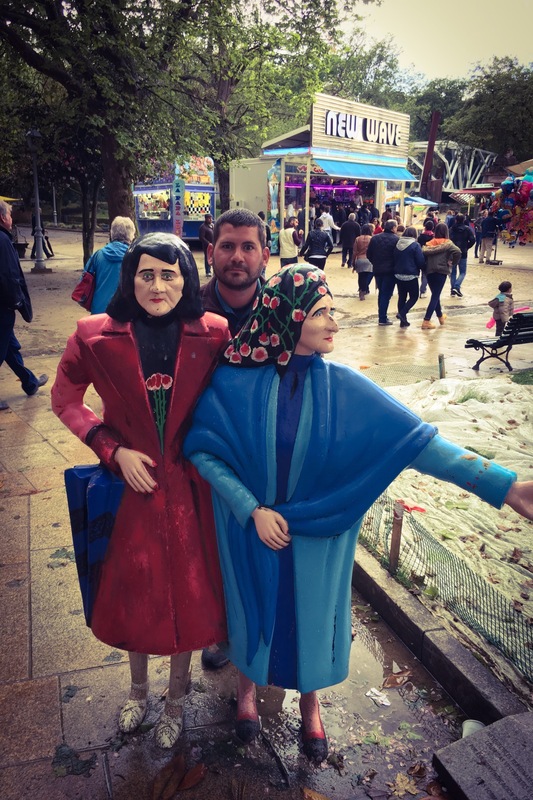 ¡Hasta Santiago!